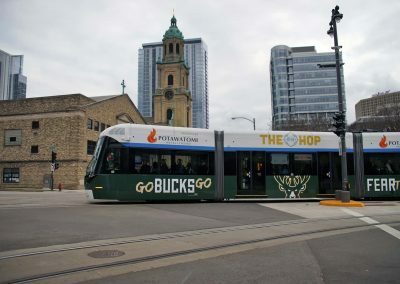 To celebrate the start of the NBA Playoffs, the Bucks have taken over downtown Milwaukee with a “Bucksification” of branding on the Water Street BMO Harris Bank office tower, one of The Hop streetcars, two downtown skywalks, and dyeing the Milwaukee River green. 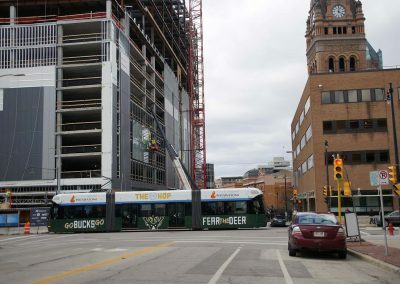 On April 11, BMO Harris employees installed vinyl decals on the west-facing windows of its 770 N. Water Street office building to configure an 18-story “Fear the Deer” image. 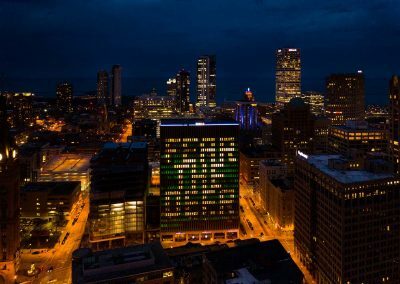 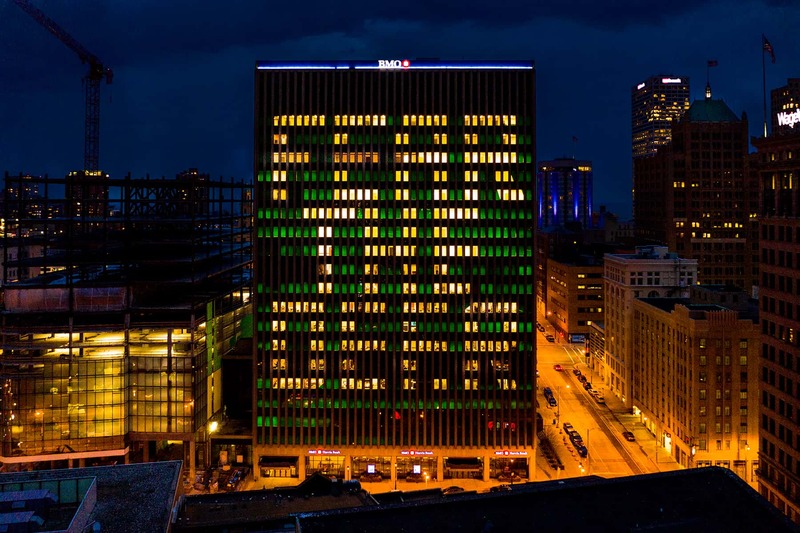 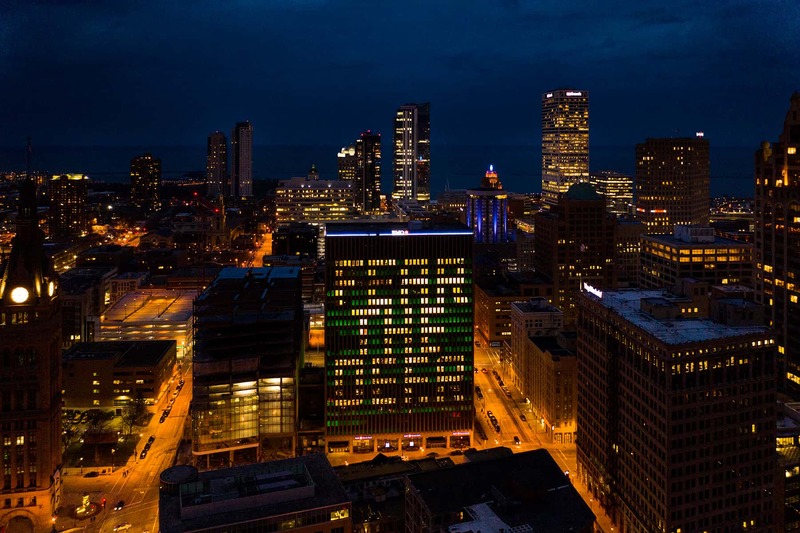 As the official bank of the Milwaukee Bucks, BMO Harris staff wanted to show support for their city and their team. 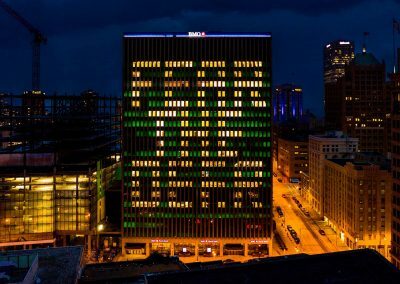 The night display will remain lit through the first round of the playoffs. 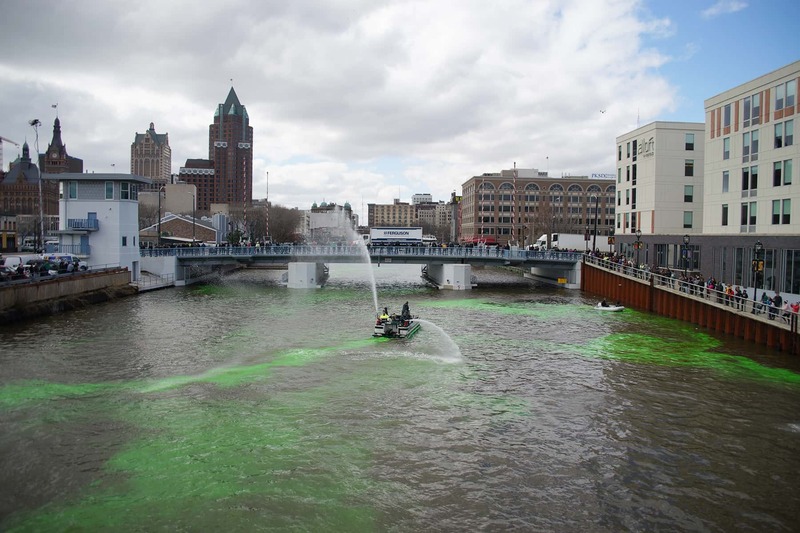 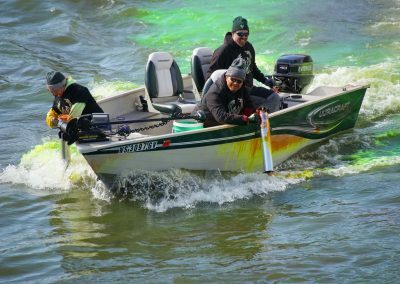 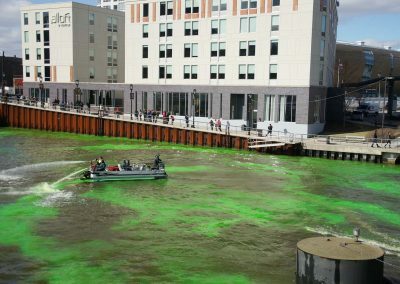 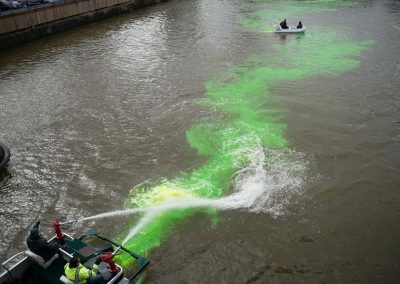 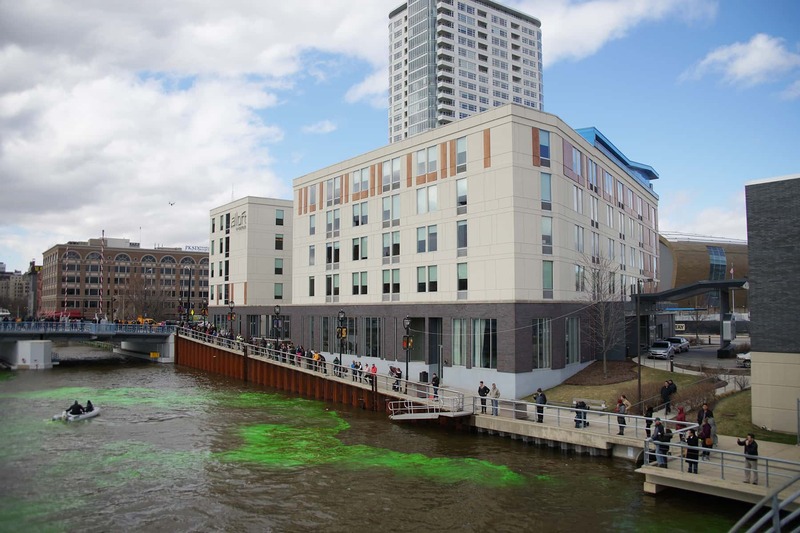 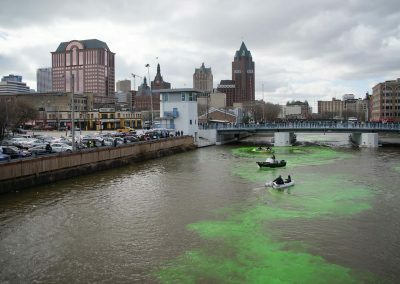 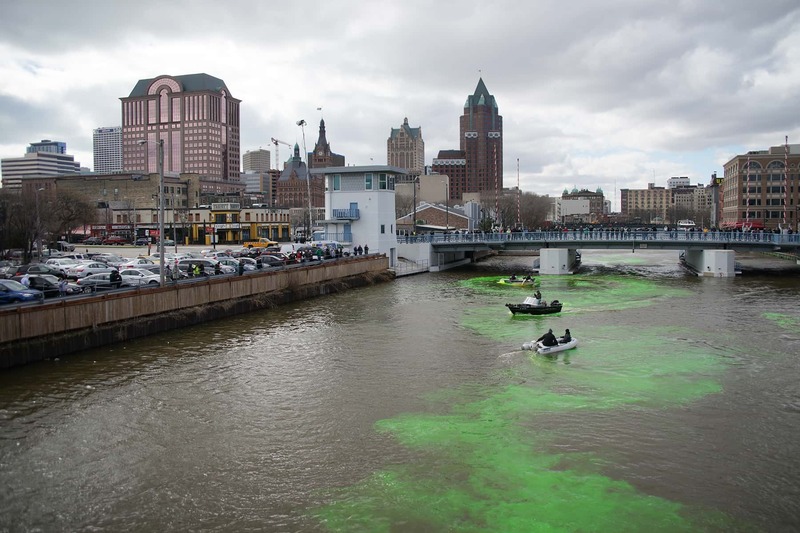 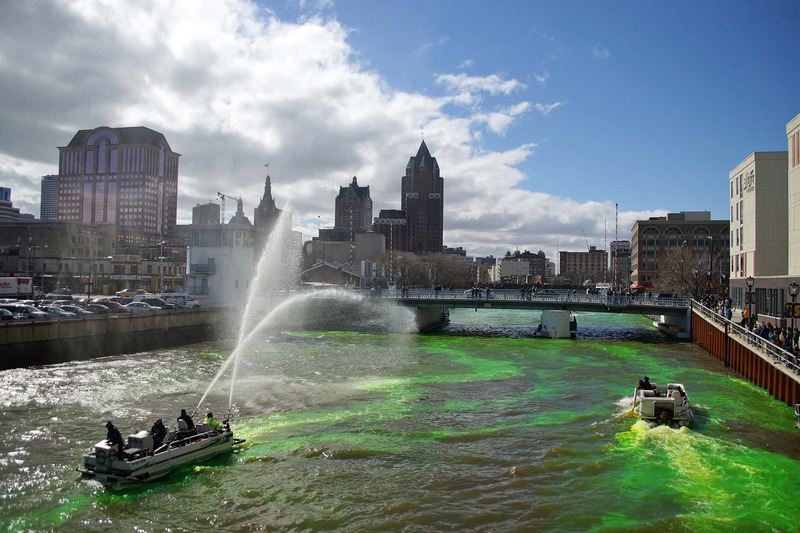 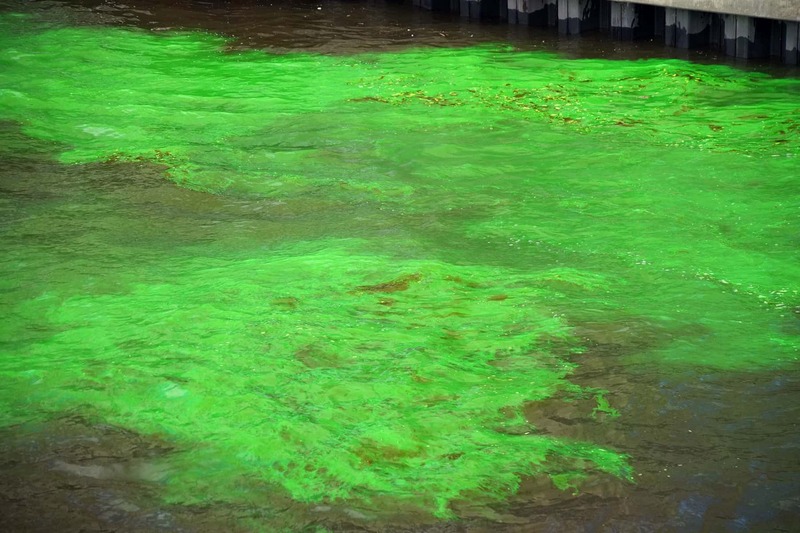 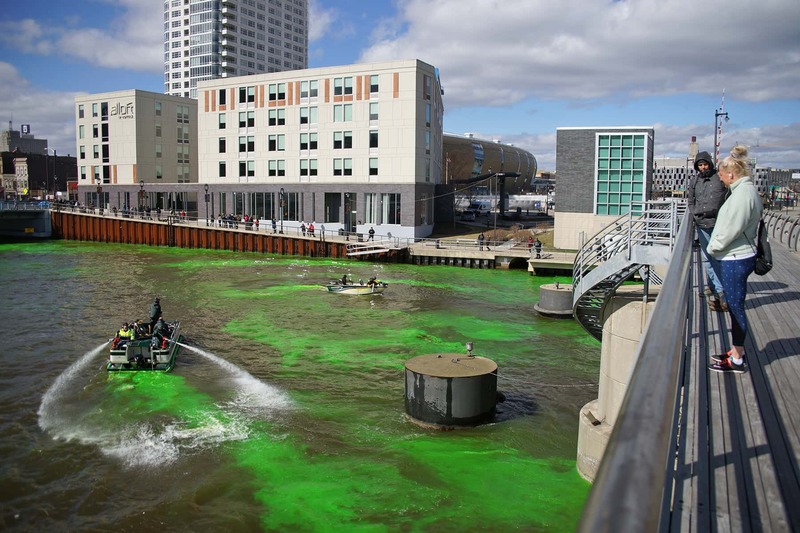 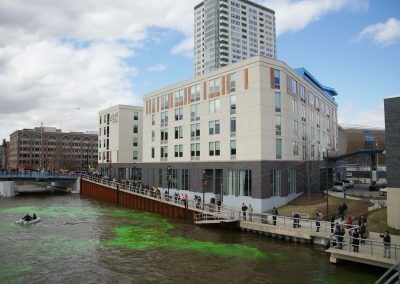 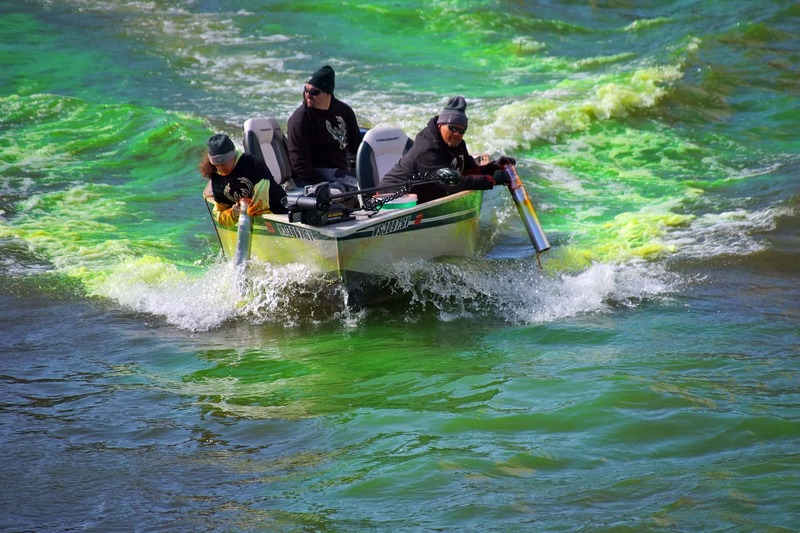 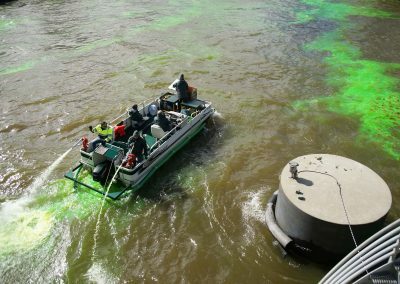 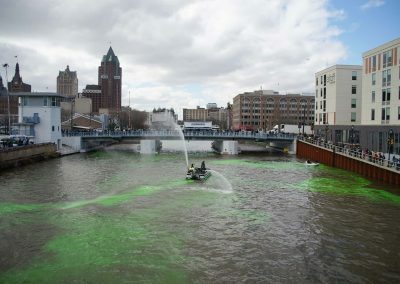 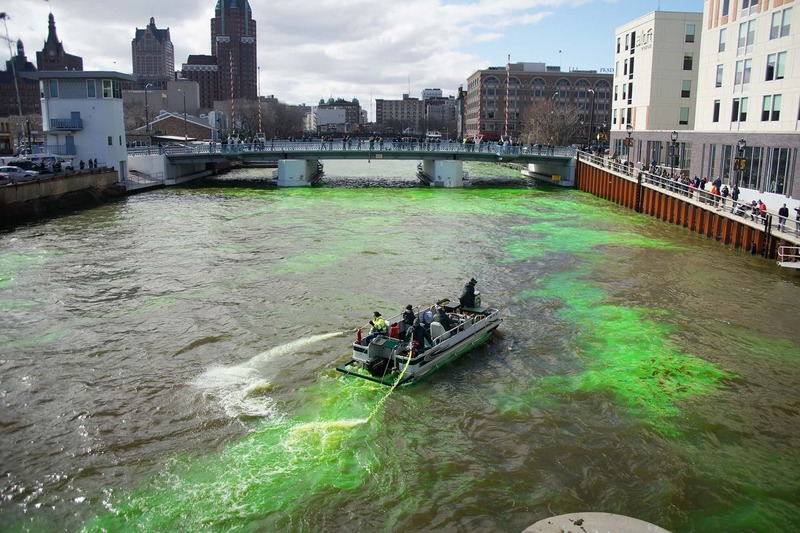 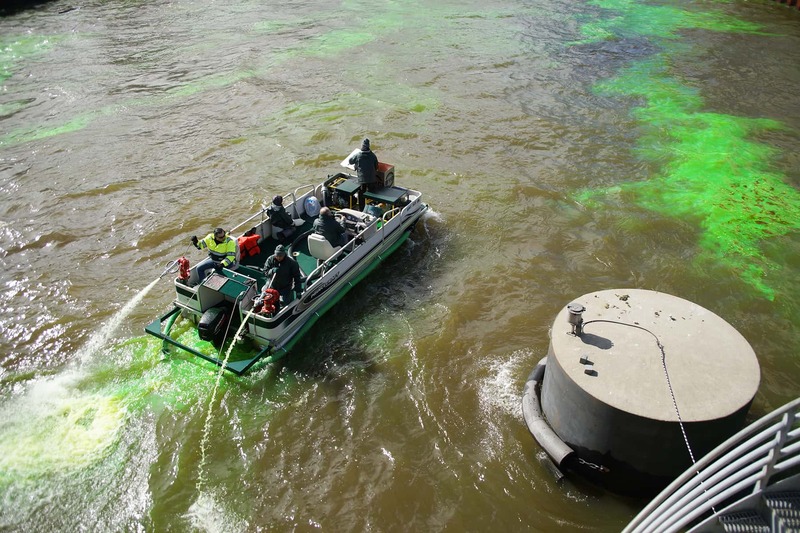 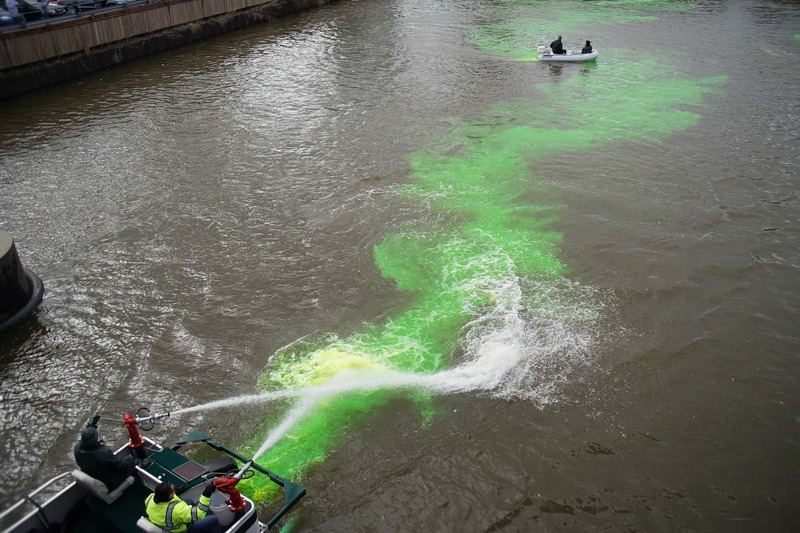 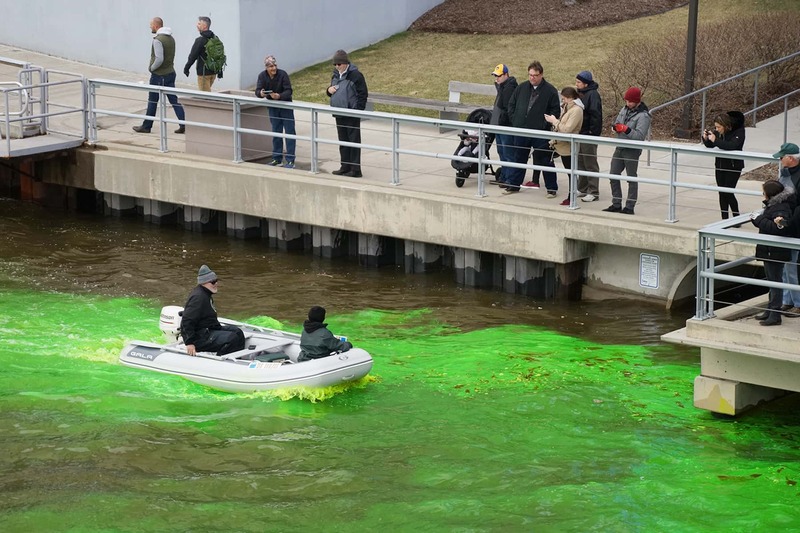 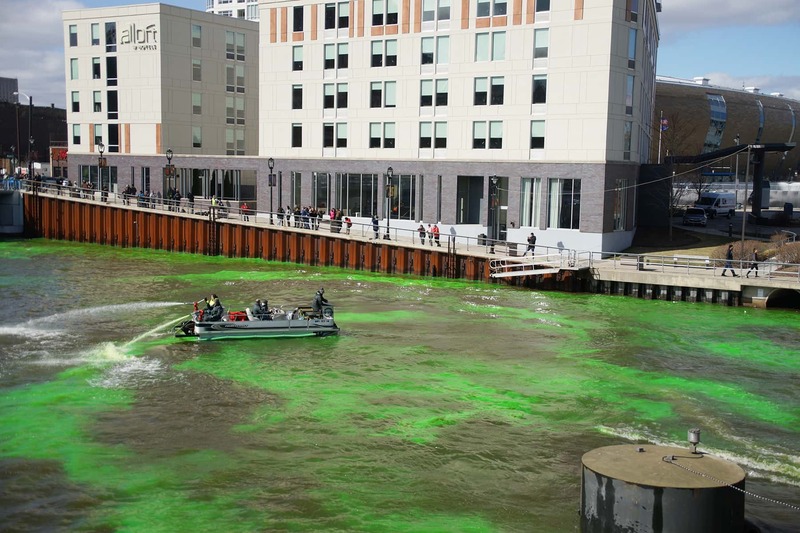 On April 12, the Milwaukee River turned the color green, and not from an algae bloom. 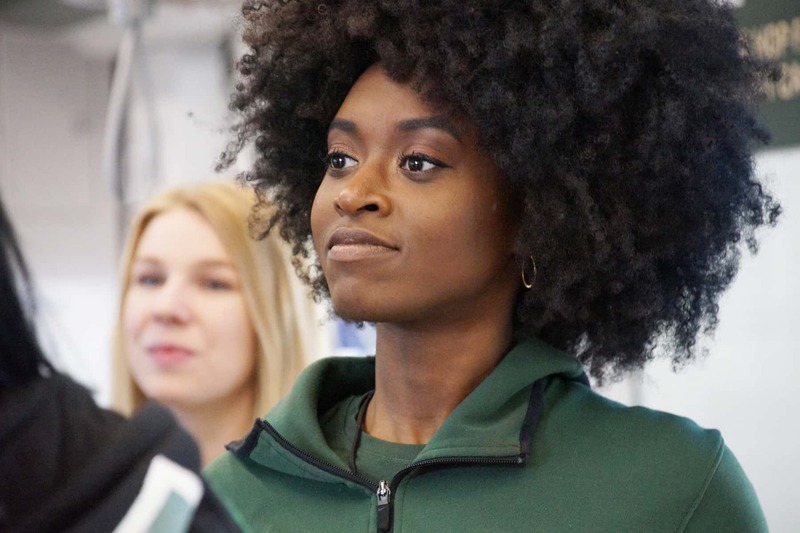 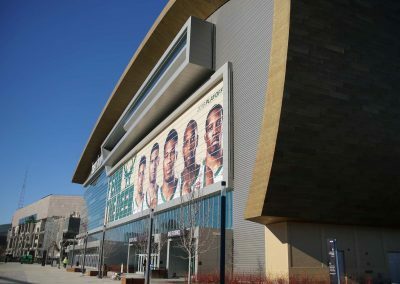 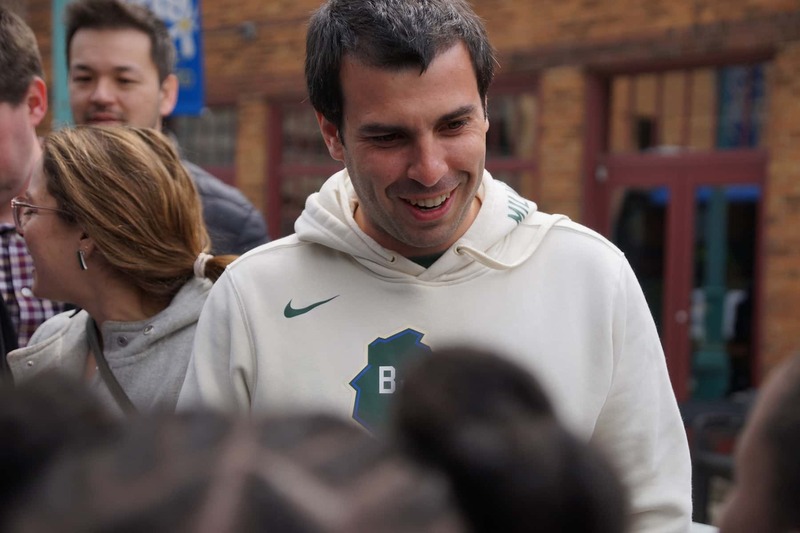 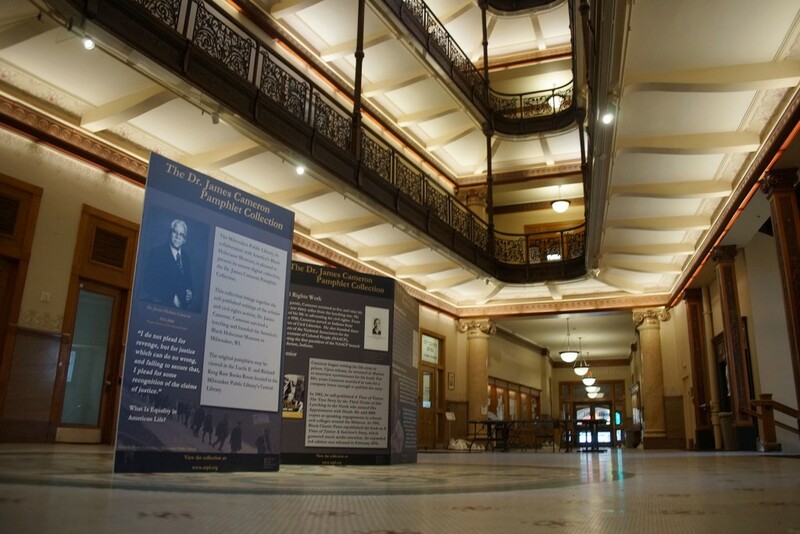 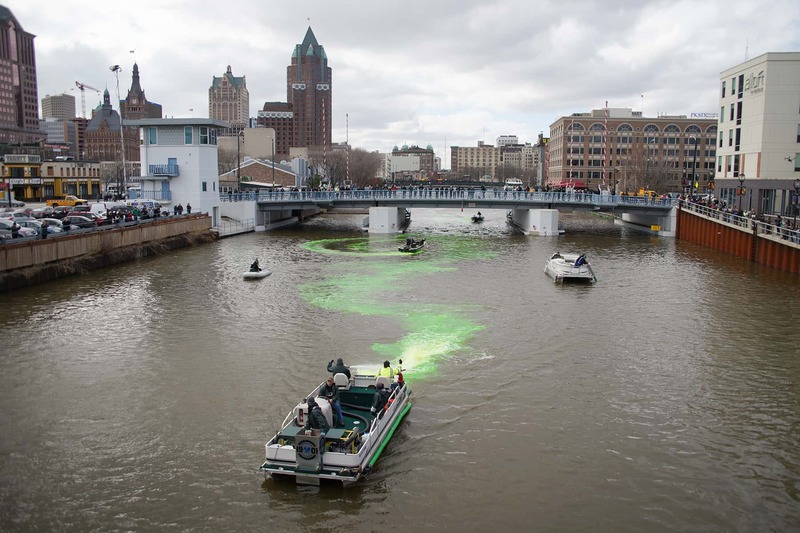 The Bucks worked closely with the Mayor’s office and the Department of Natural Resources to create the memorable sight, using an eye-popping bright green hue to match the team’s color. 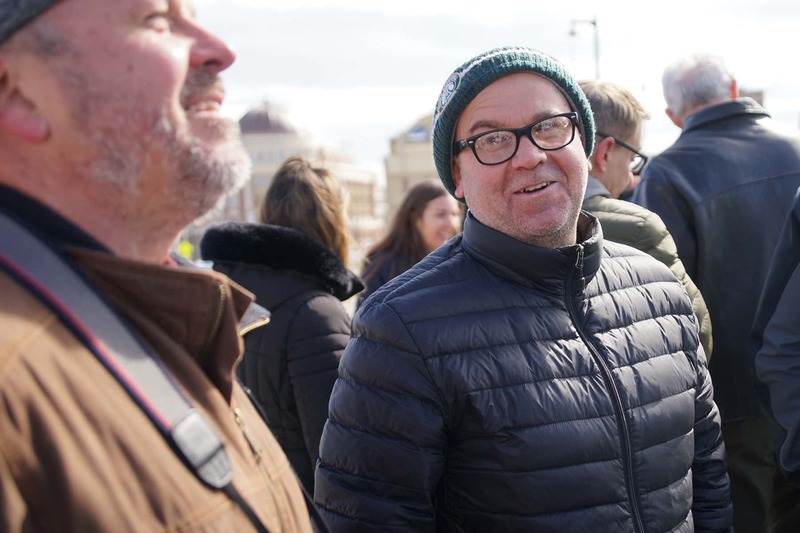 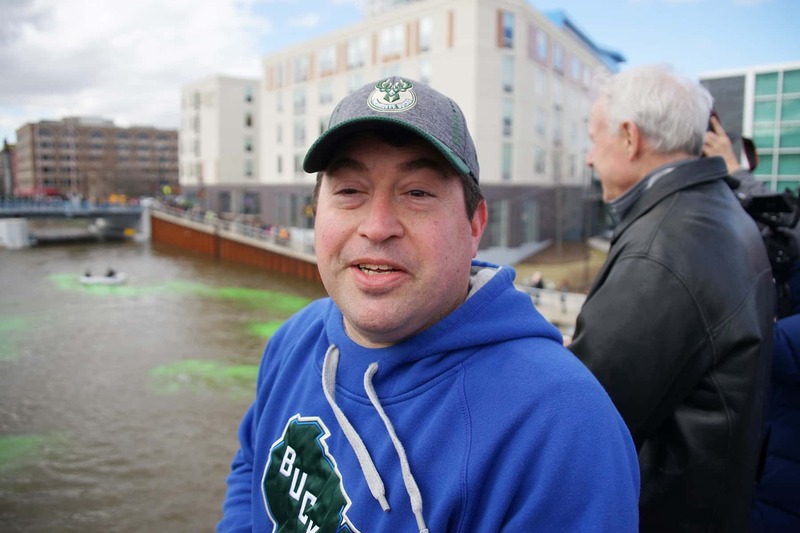 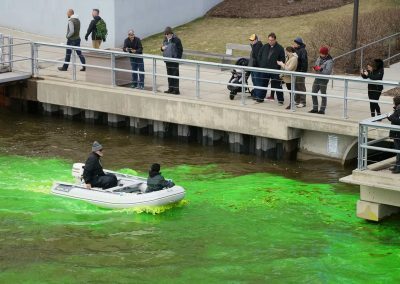 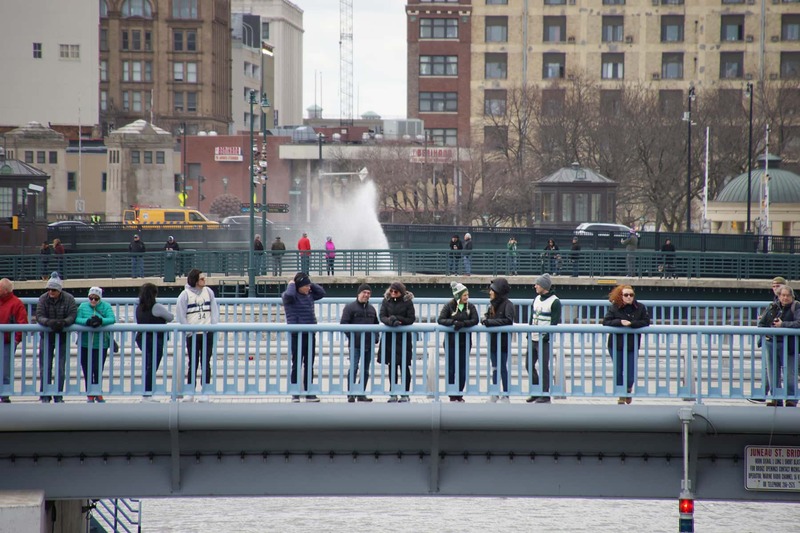 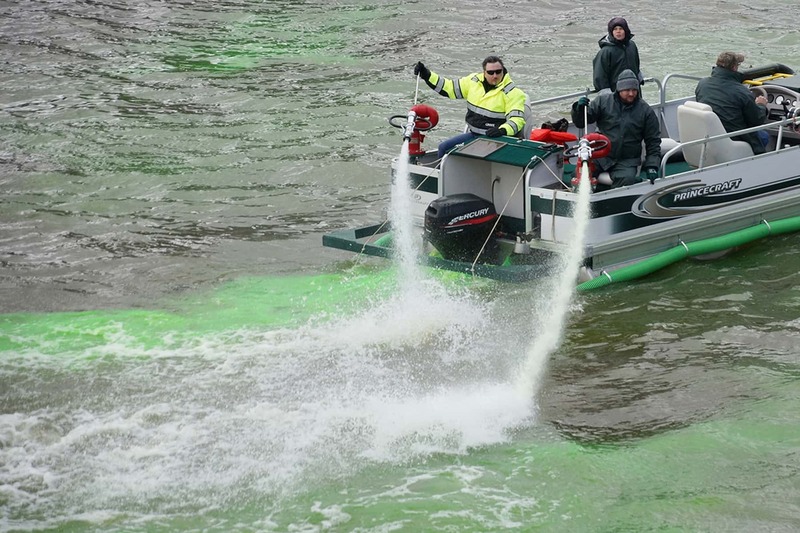 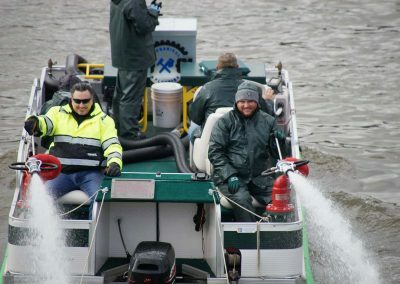 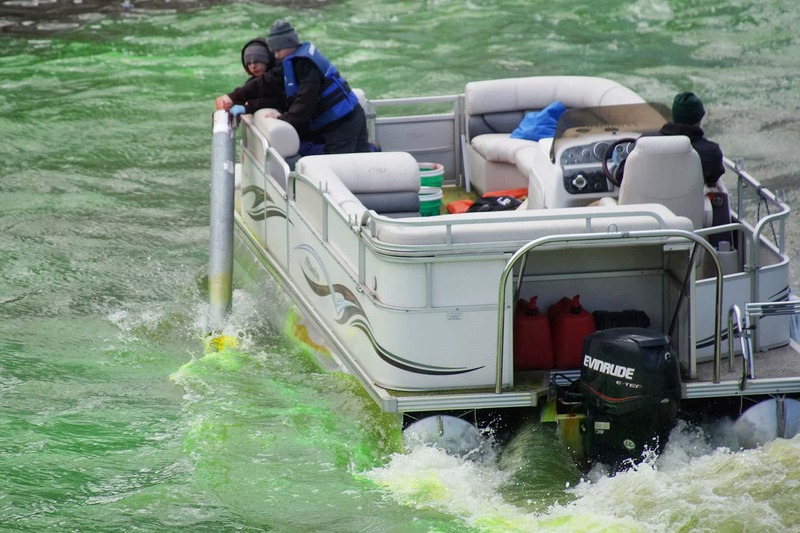 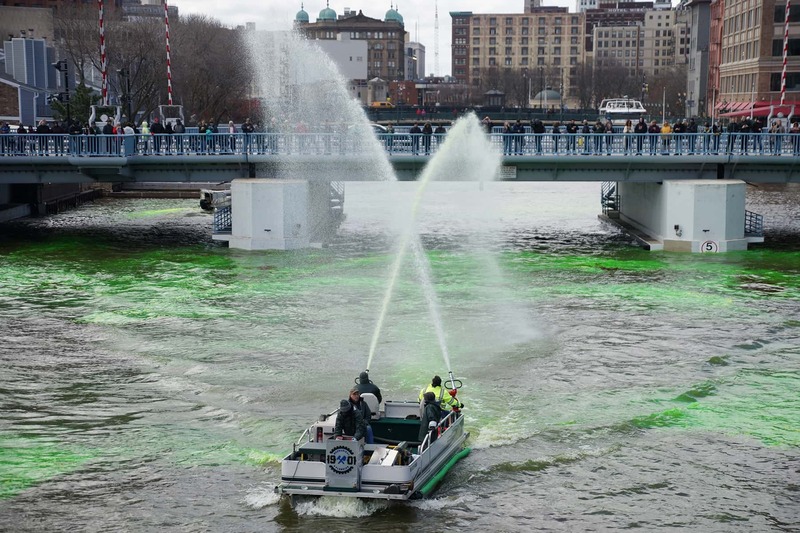 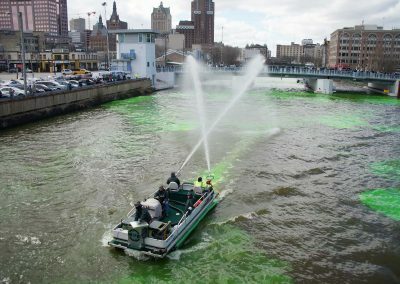 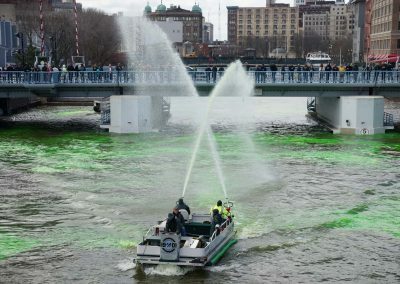 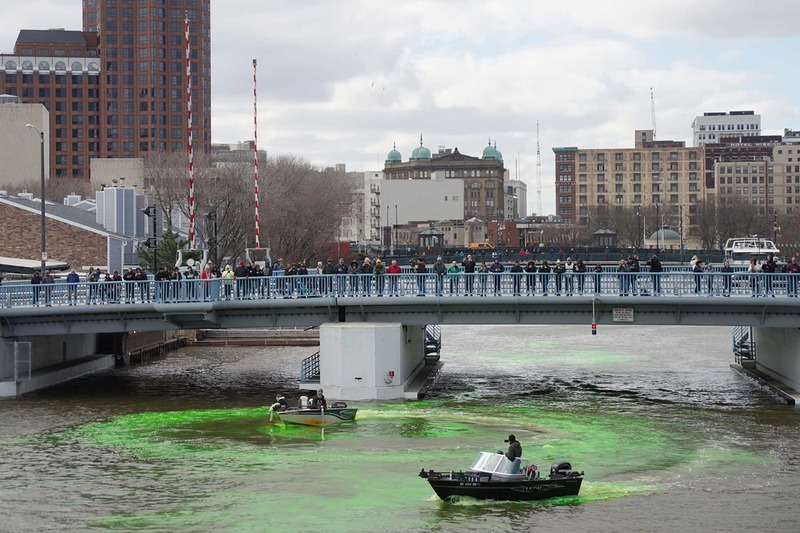 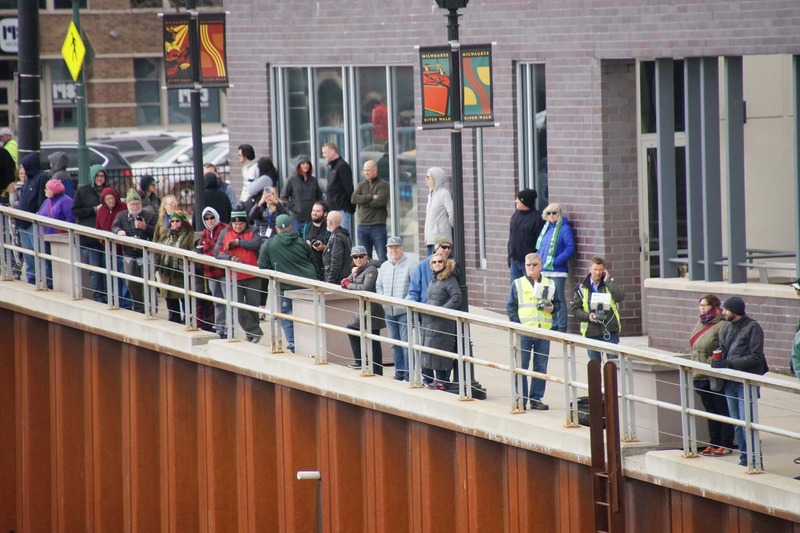 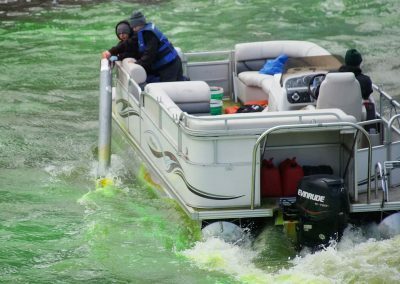 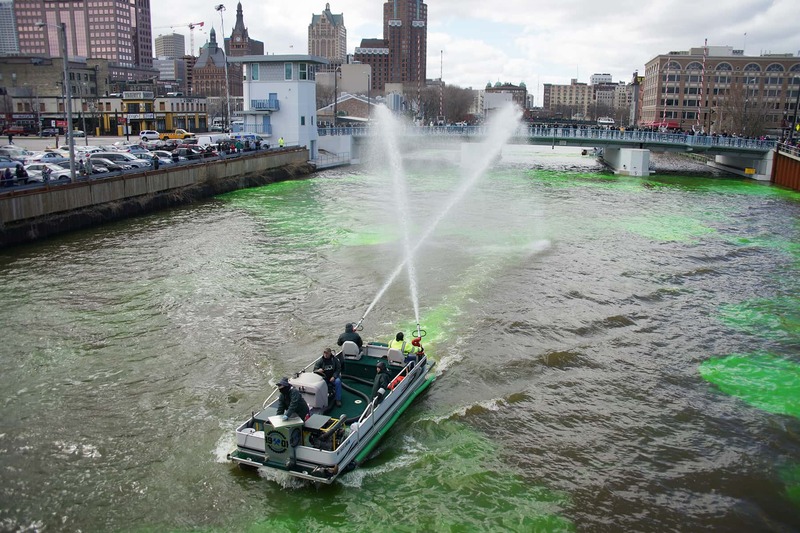 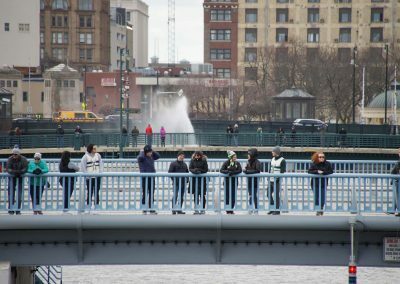 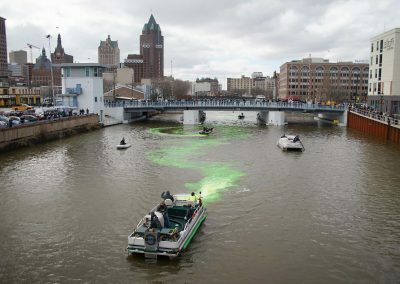 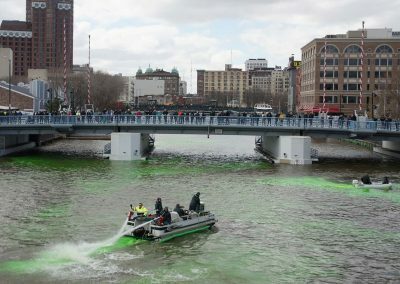 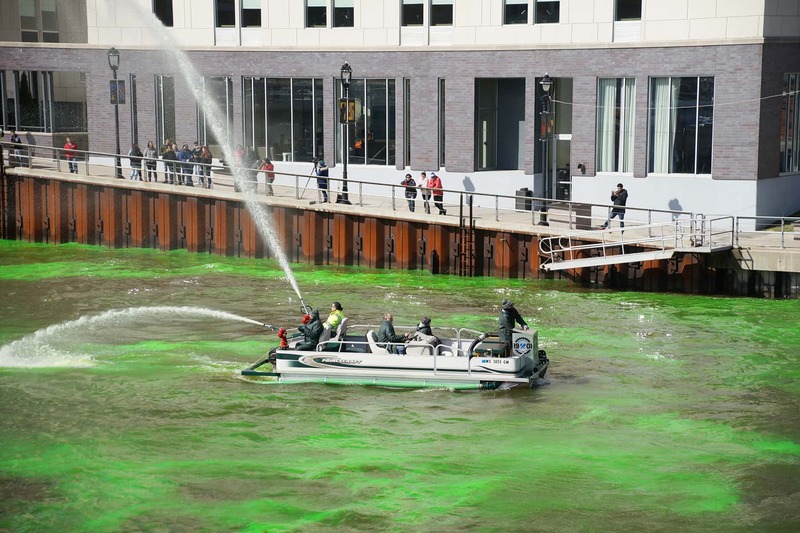 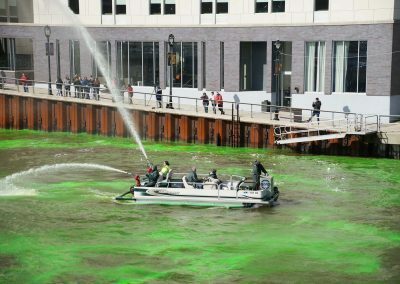 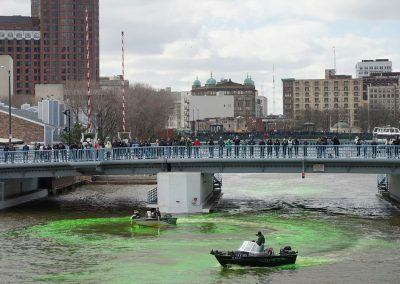 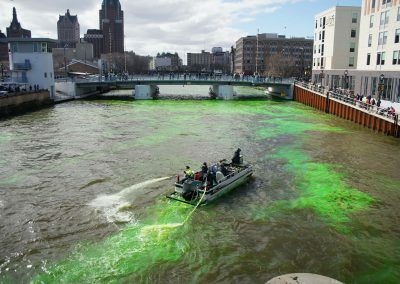 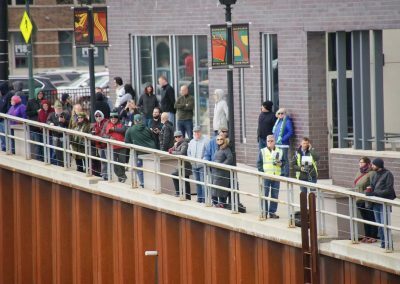 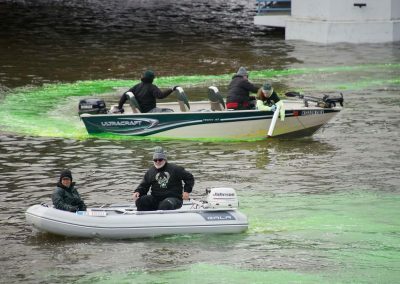 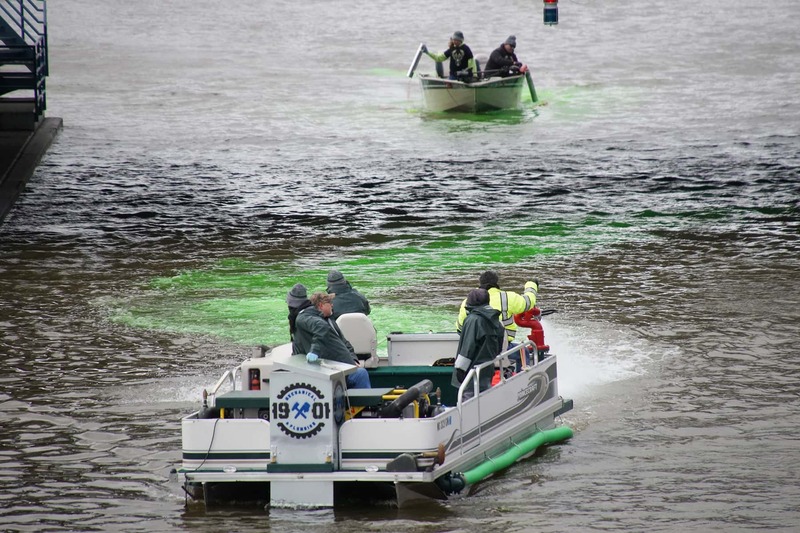 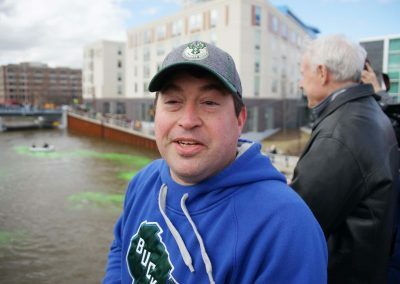 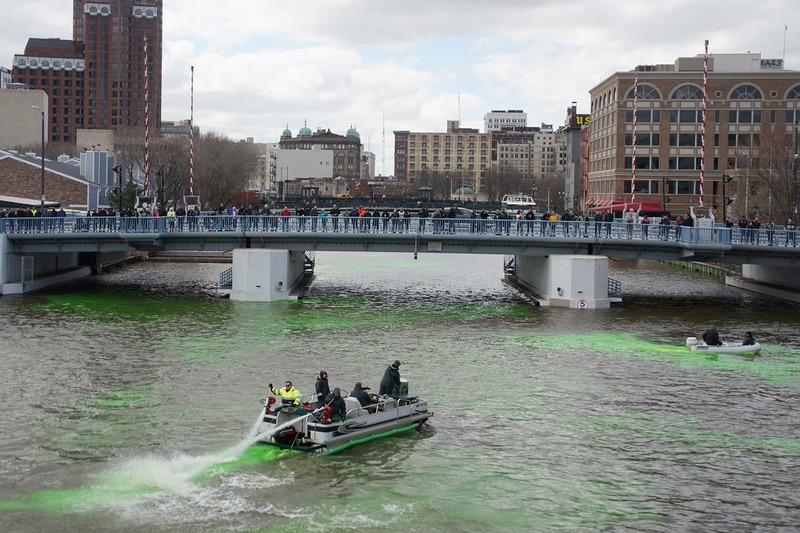 Mayor Tom Barrett and Bucks President Peter Feigin watched from the McKinley Bridge as boats crisscrossed the river, injecting green dye into the water. 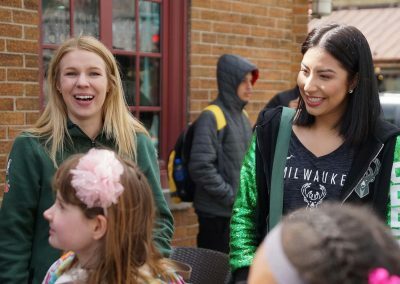 The leaders explained that as part of the planning process, both had practiced their dye skills on cupcakes and their own hair. 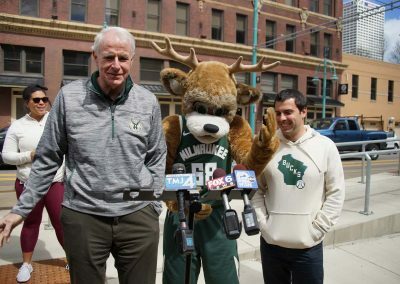 “Milwaukee is very proud to have the Bucks here. 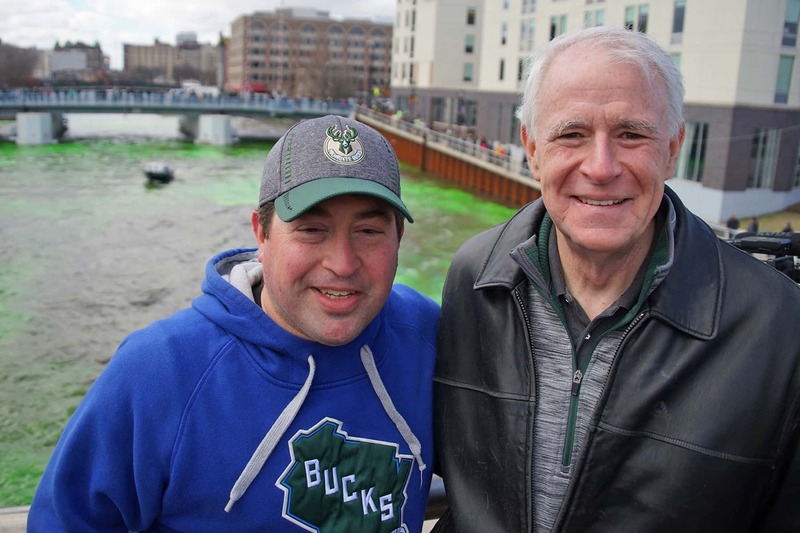 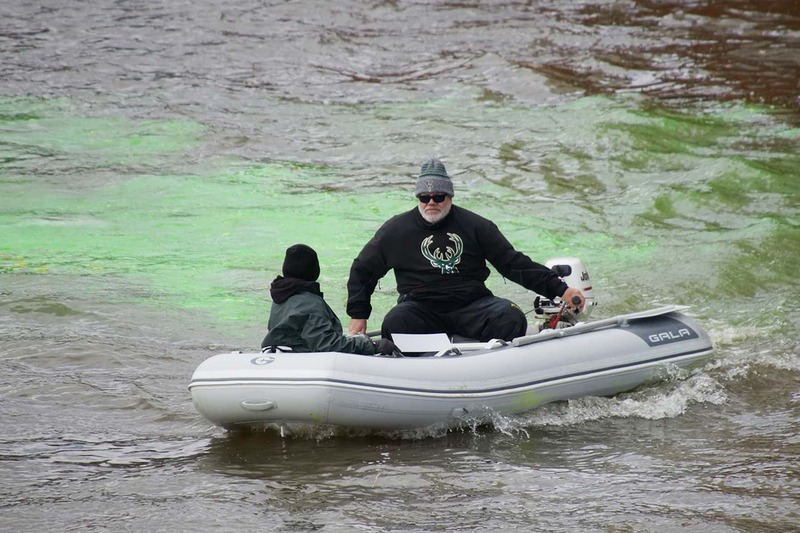 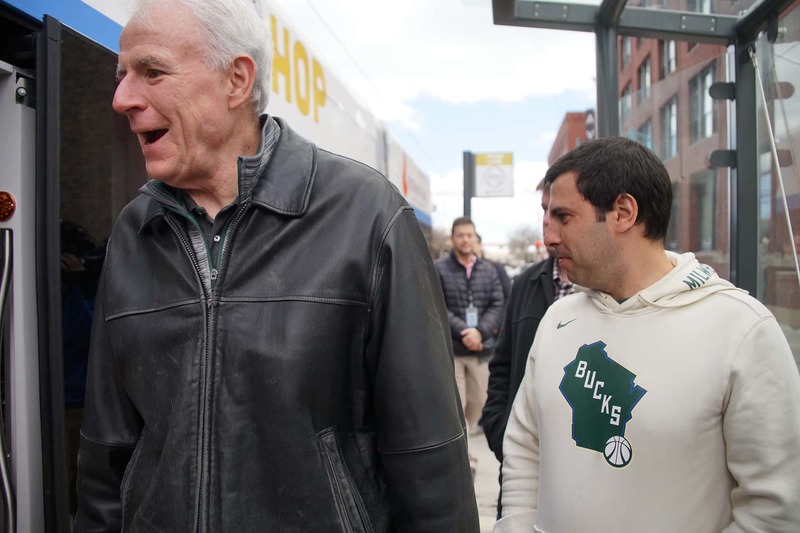 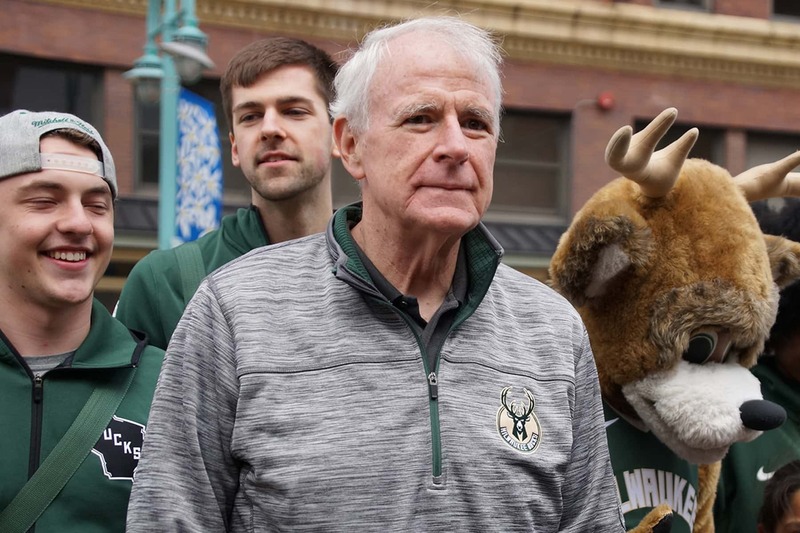 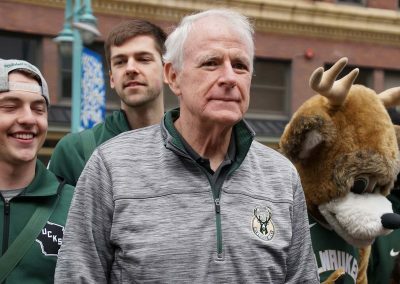 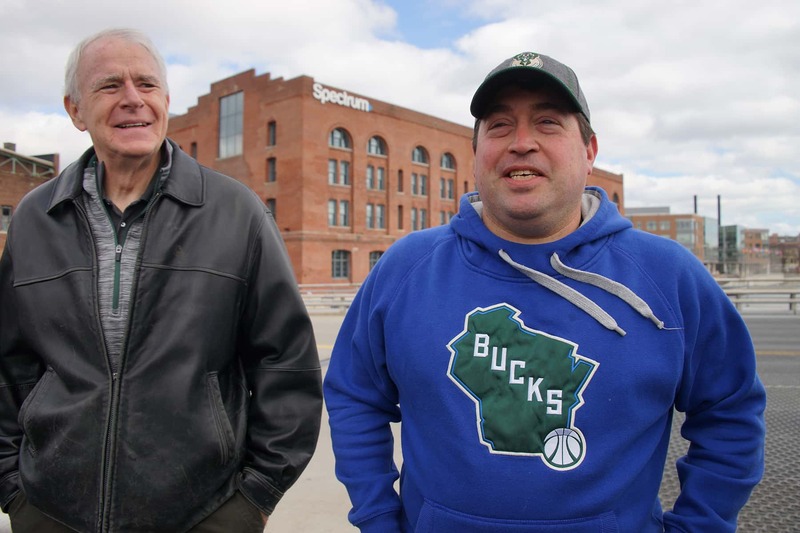 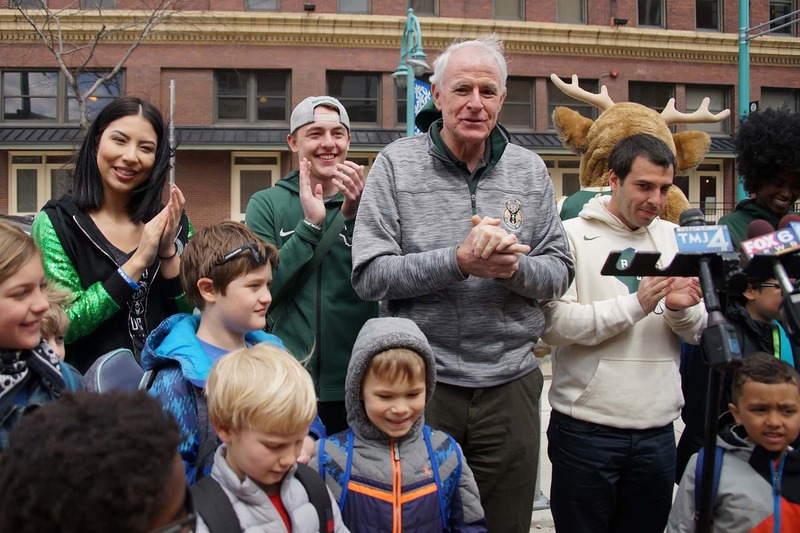 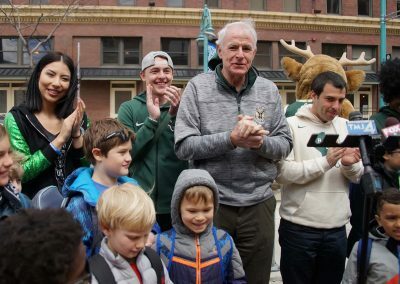 I think dyeing the river green is a great way to get even more people involved in Bucks fever,” said Mayor Barrett. 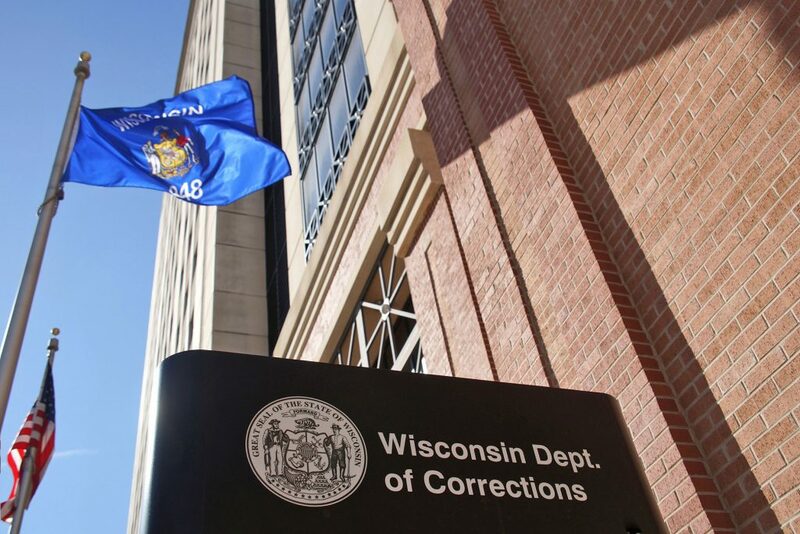 The Wisconsin Department of Natural Resources was on hand to provide assurances that the dye would not cause any environmental damage or make waterfowl sick. 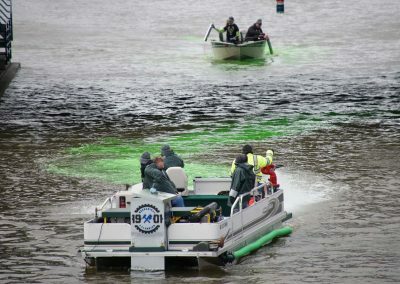 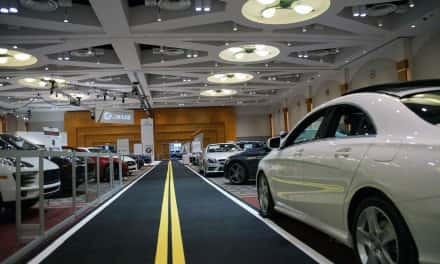 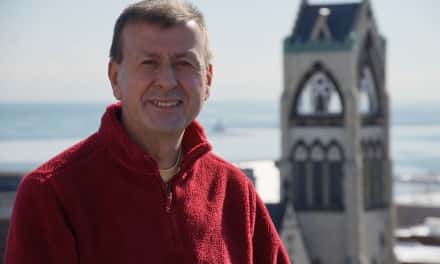 The dye used was a product specifically created to search for water leaks, and for scientists who track the flows of river currents and where different water sources converge. 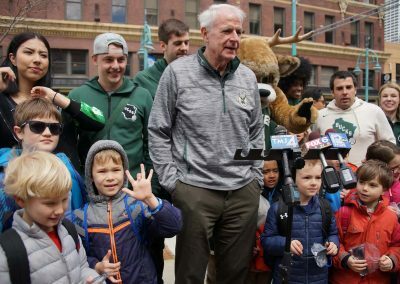 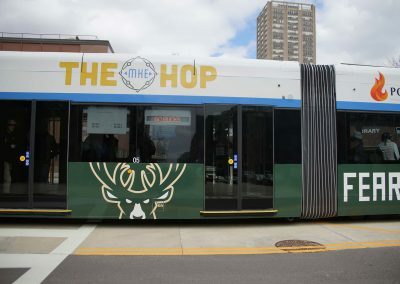 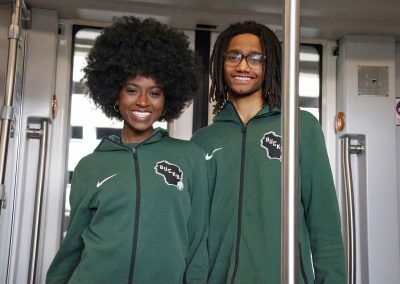 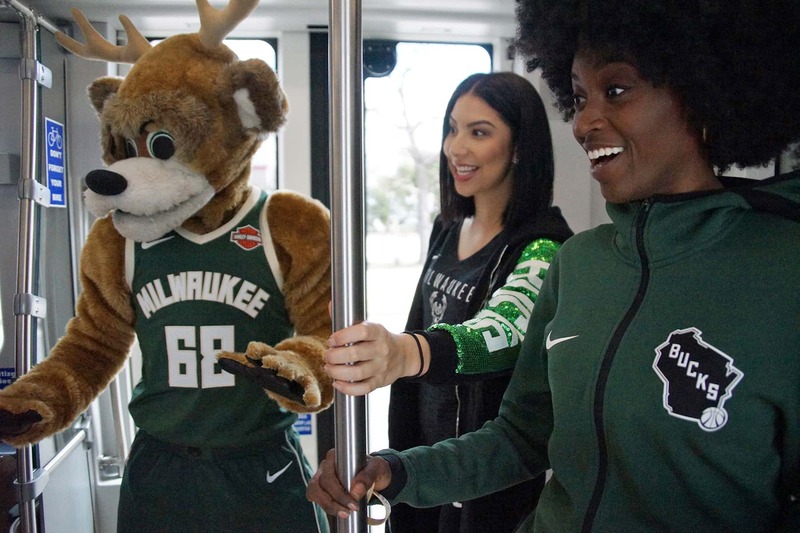 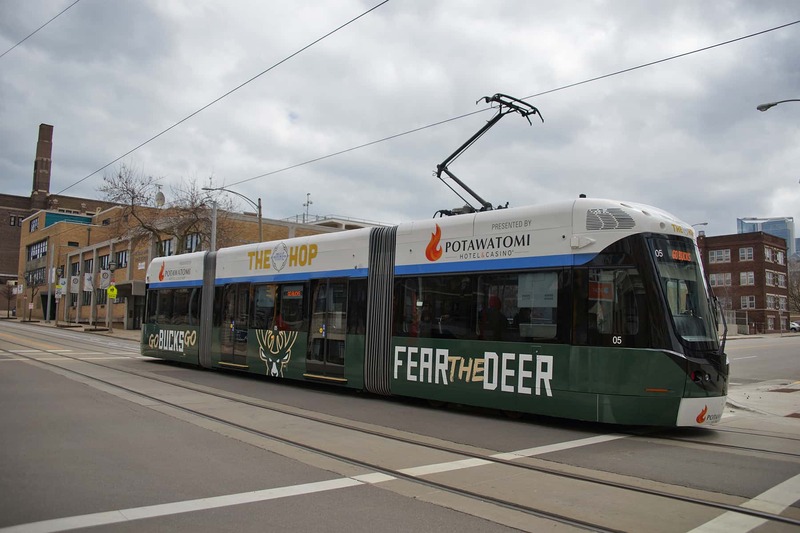 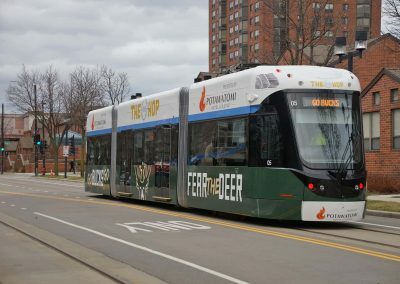 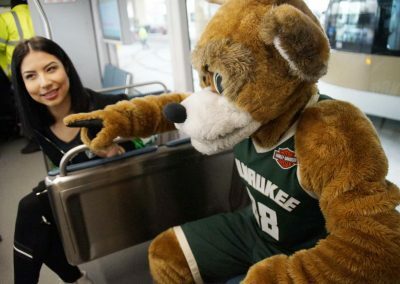 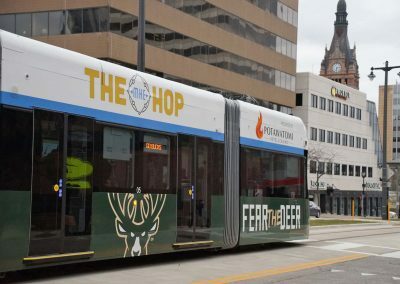 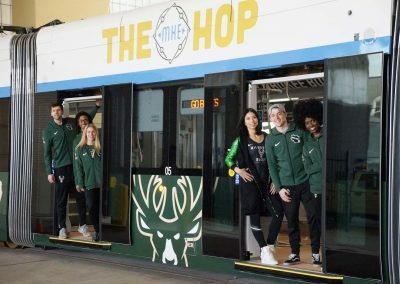 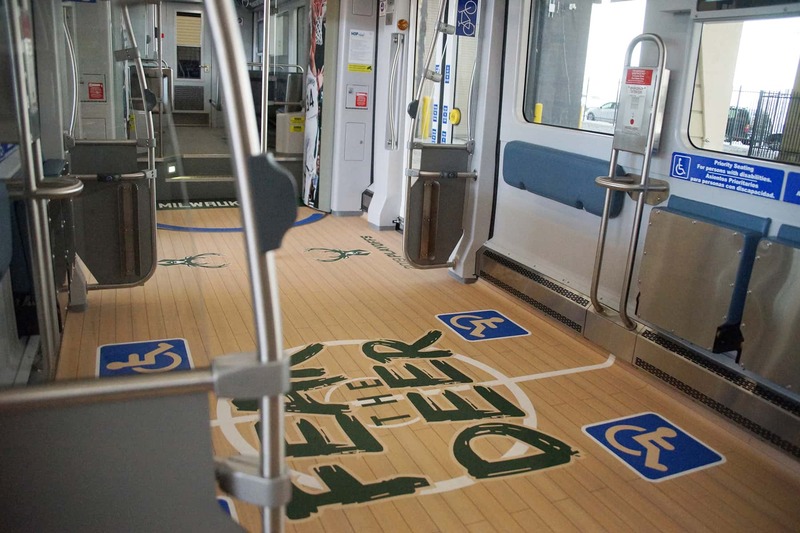 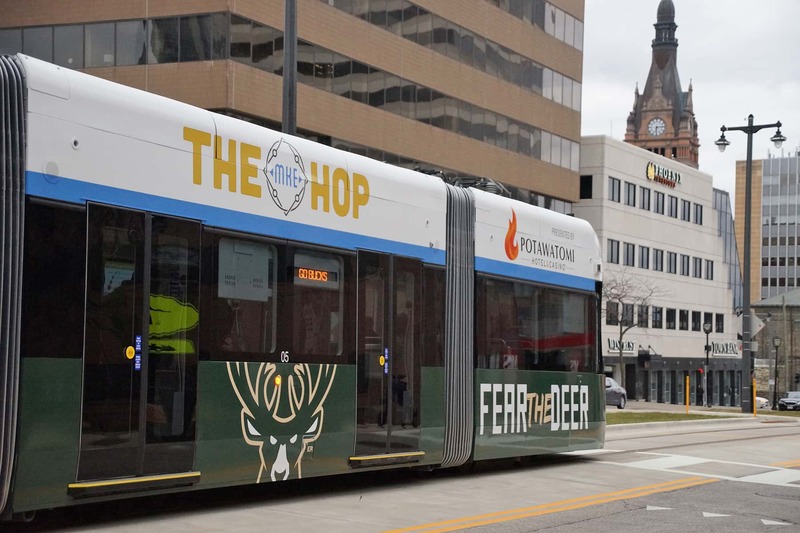 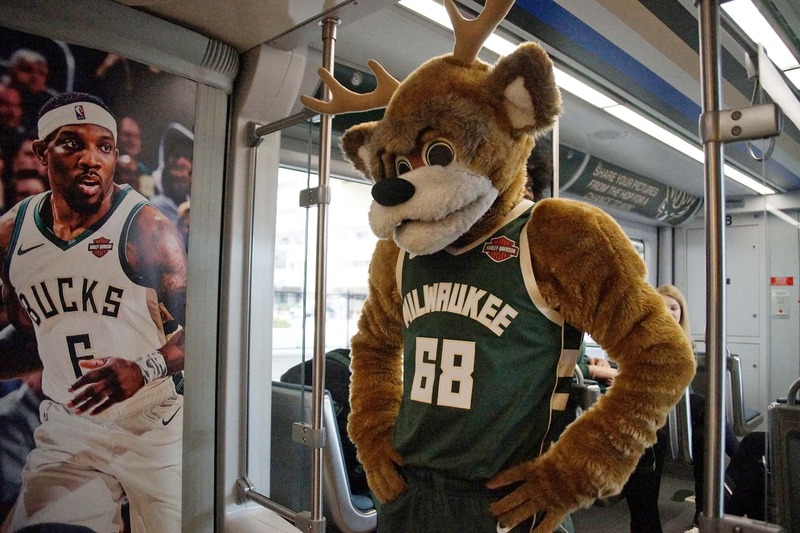 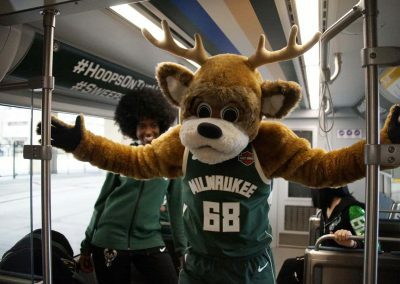 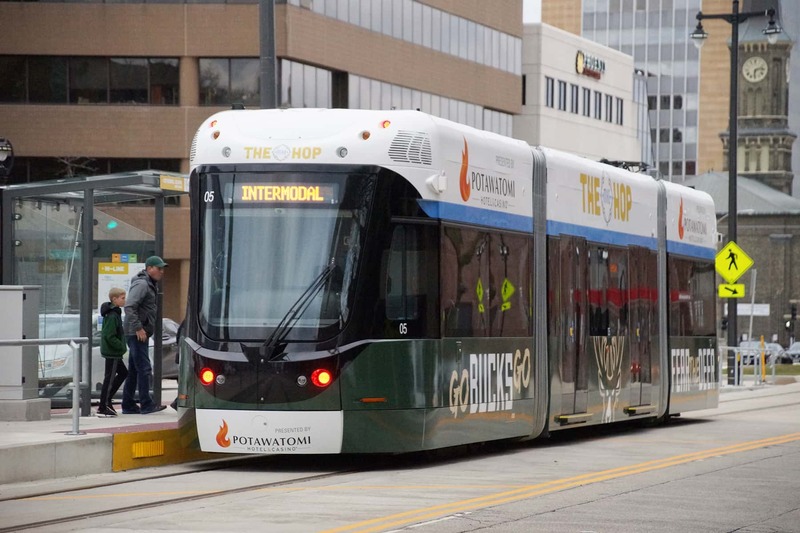 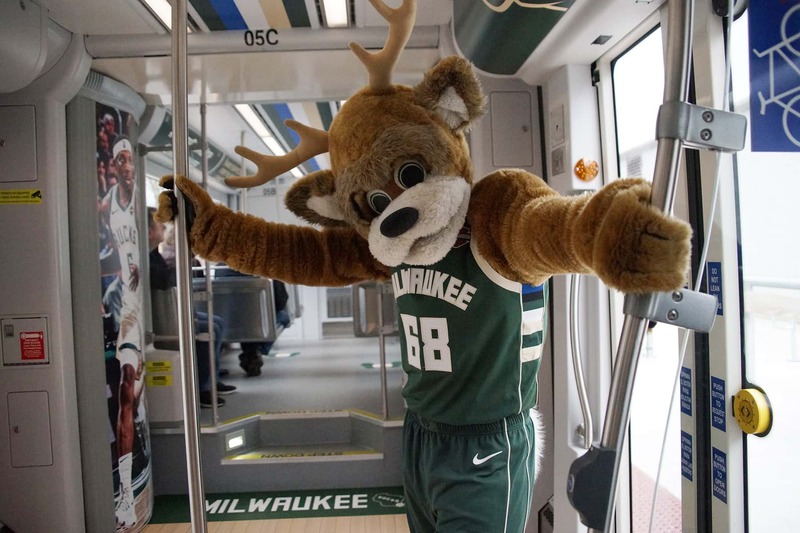 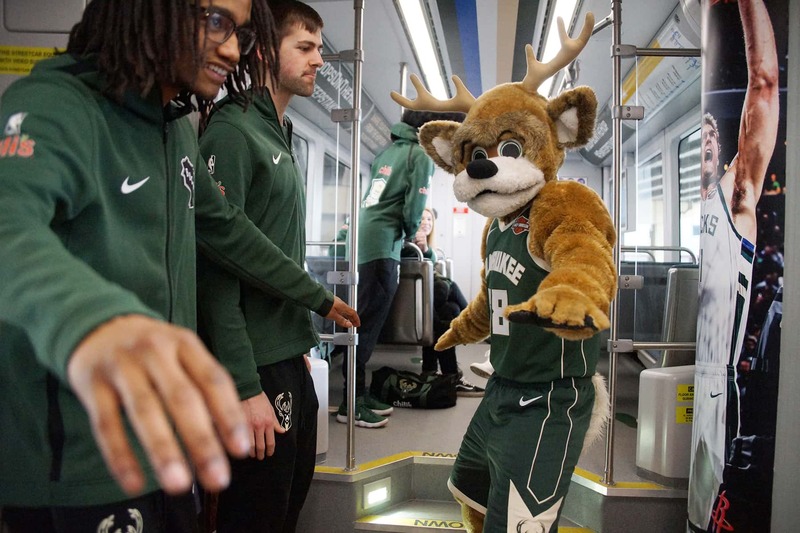 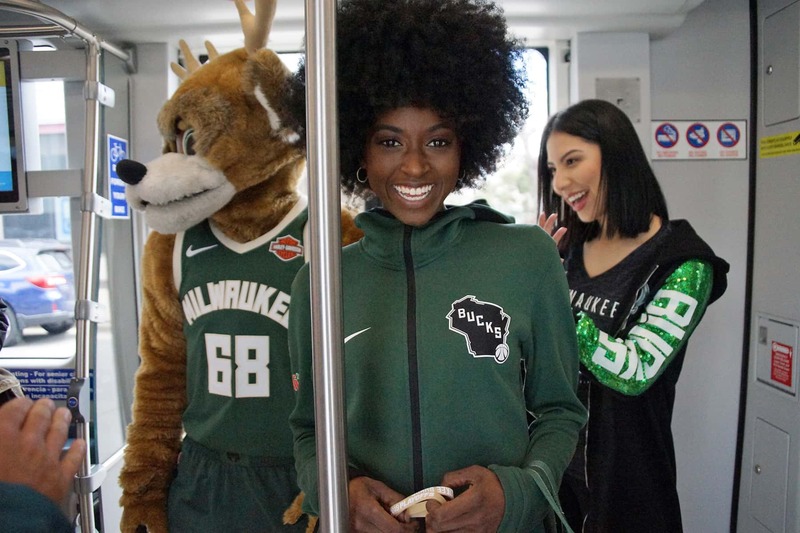 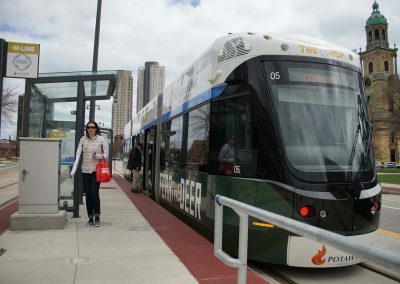 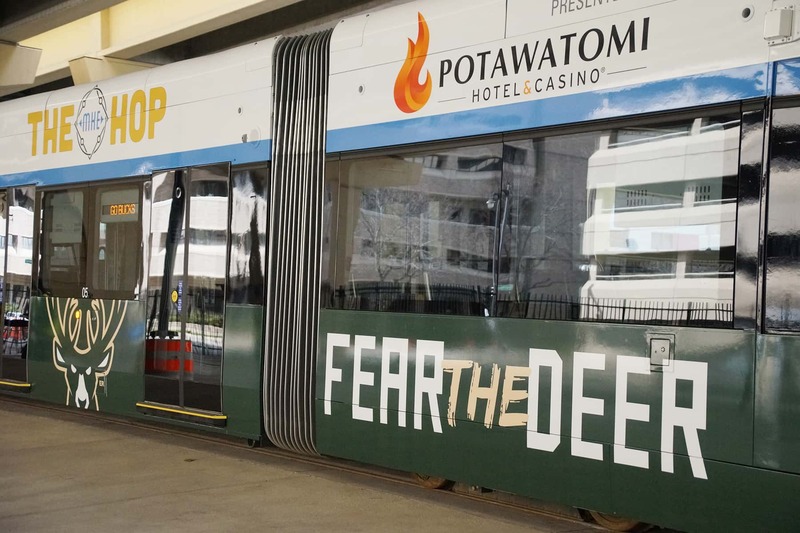 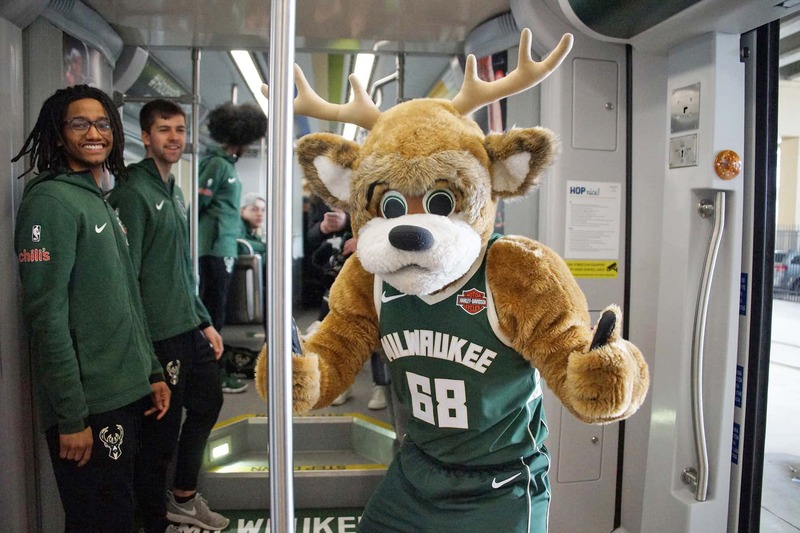 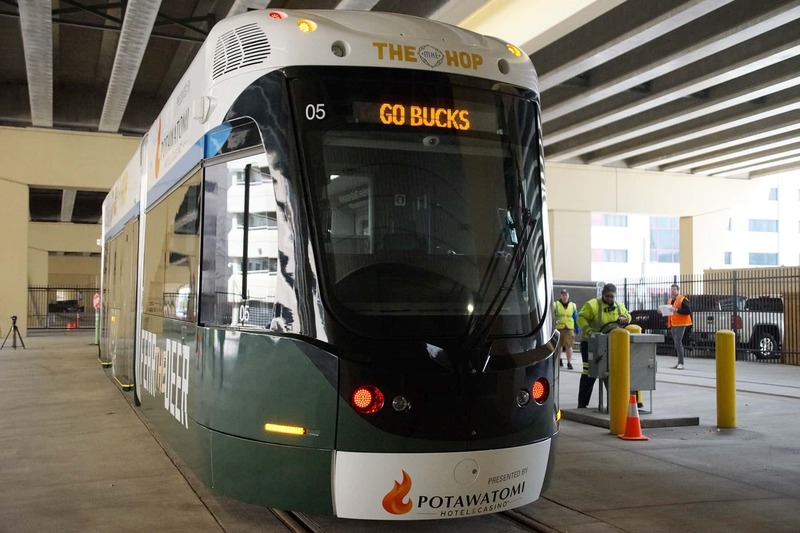 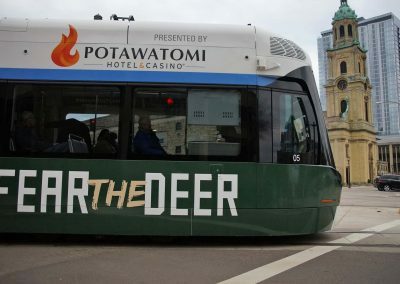 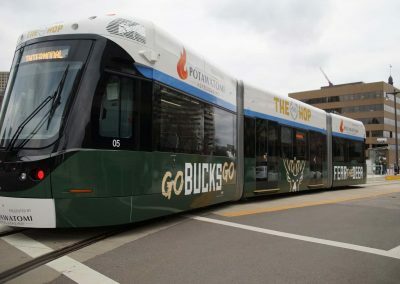 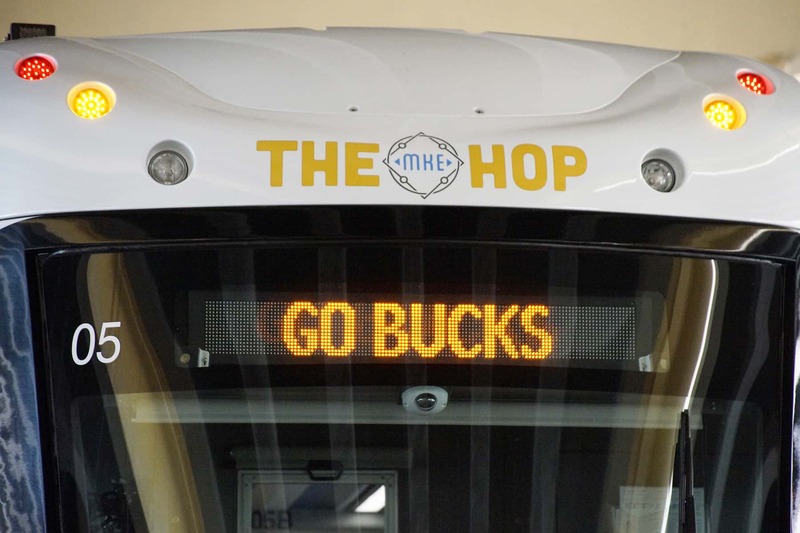 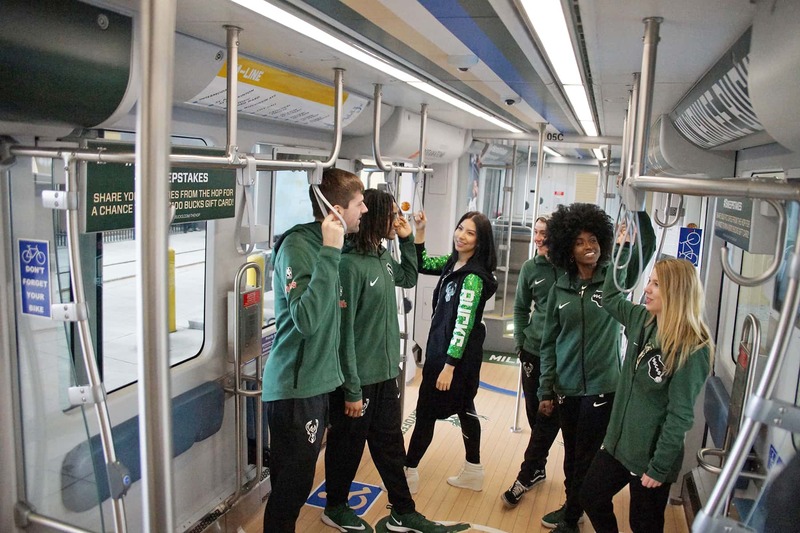 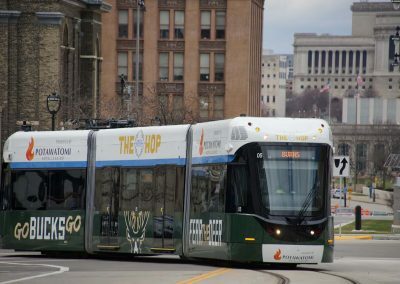 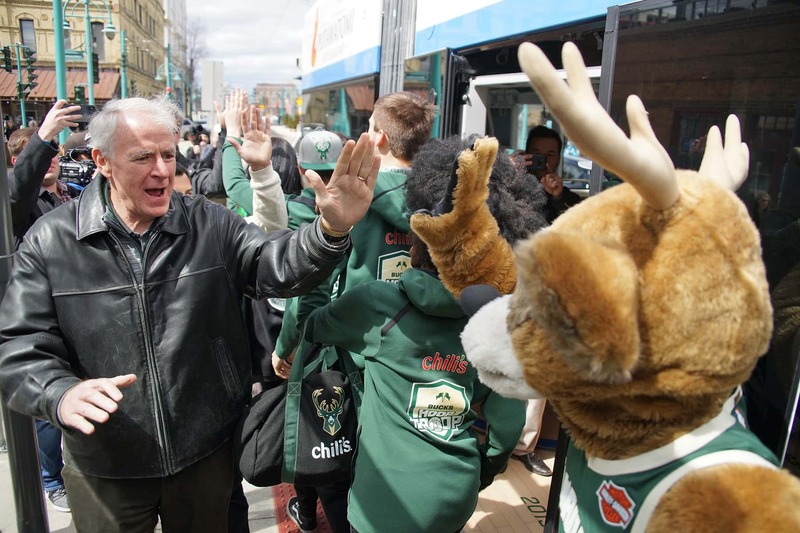 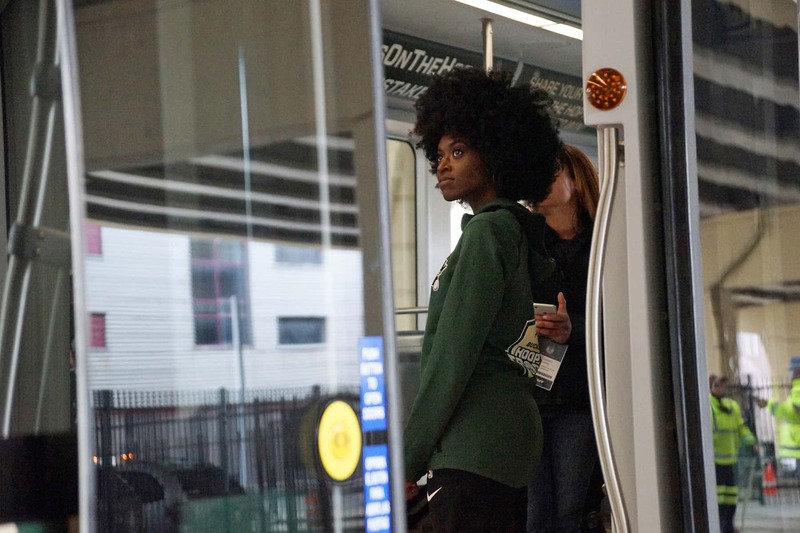 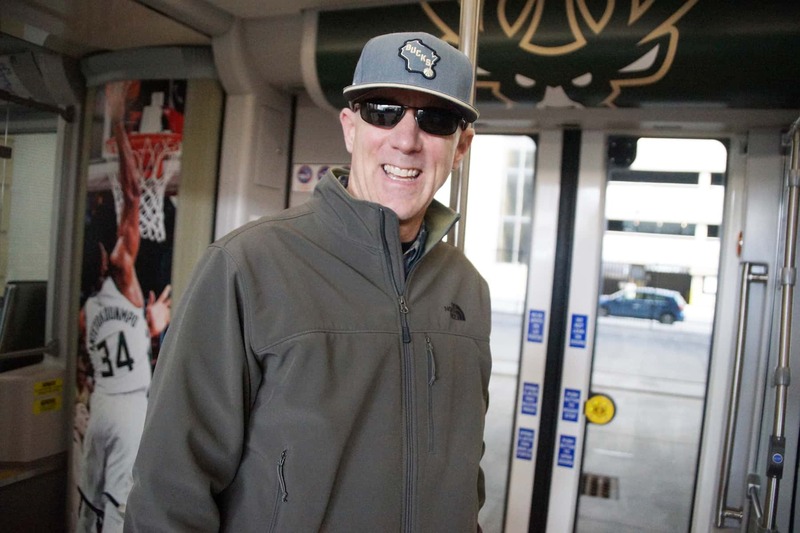 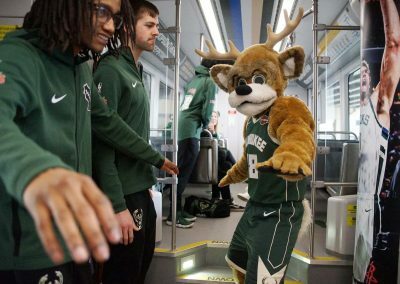 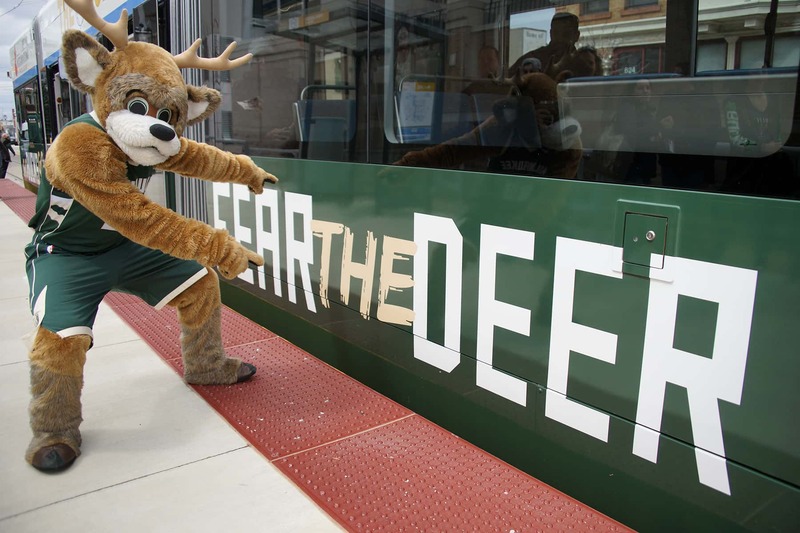 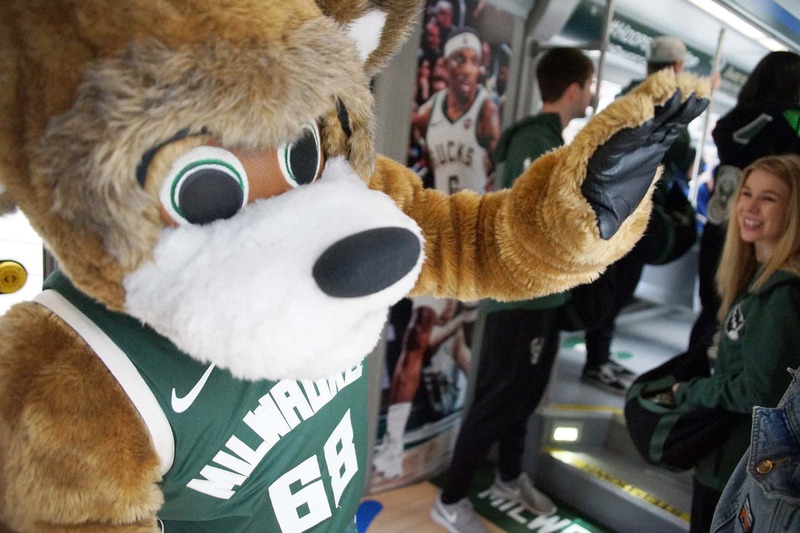 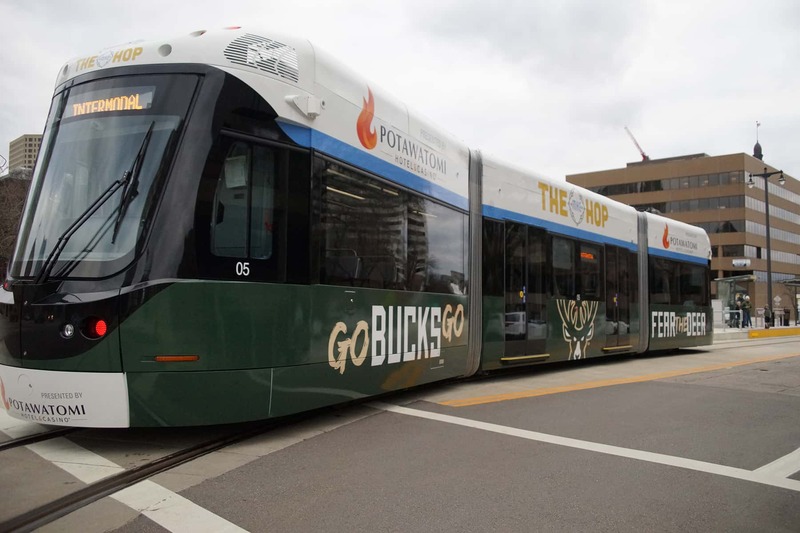 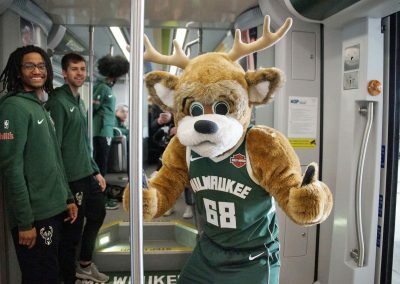 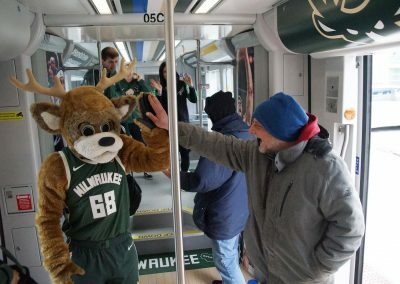 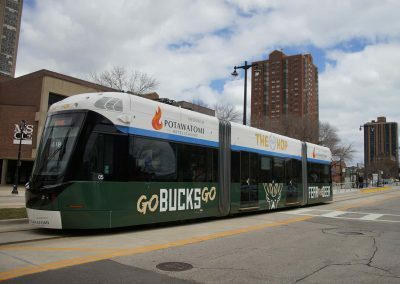 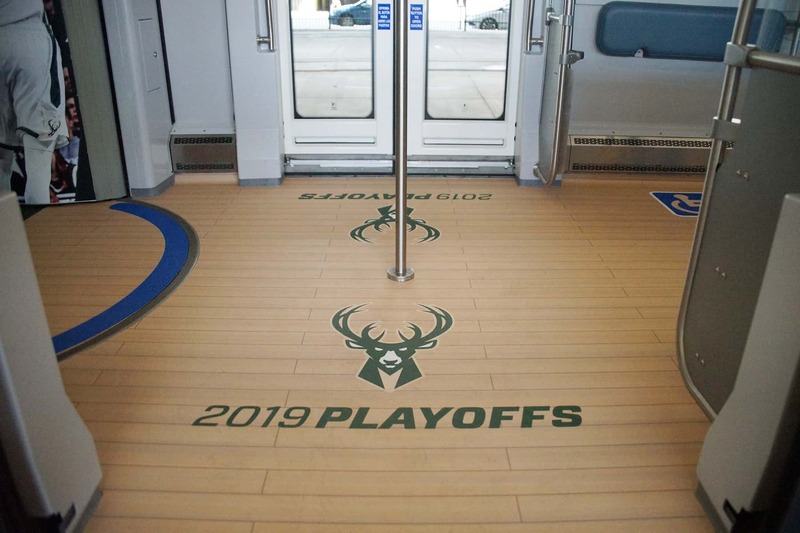 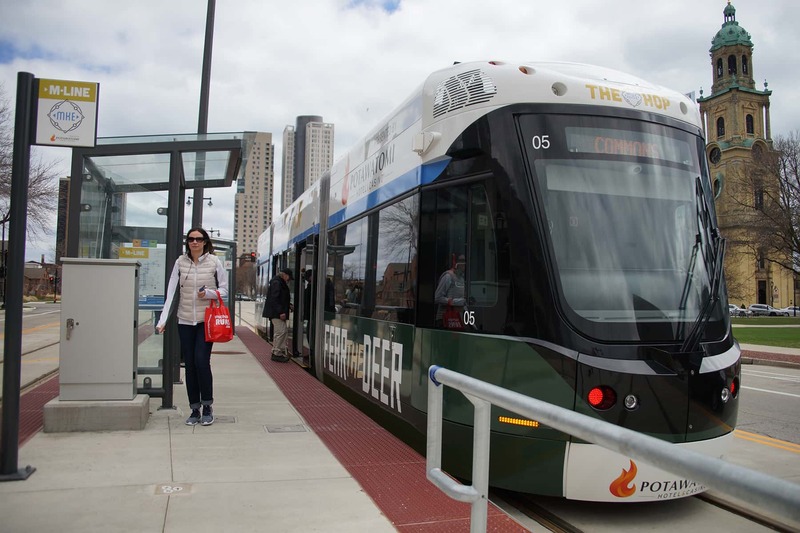 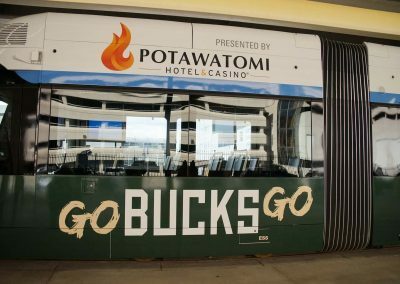 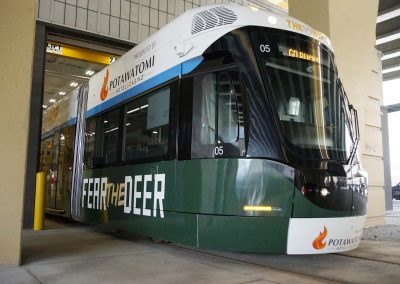 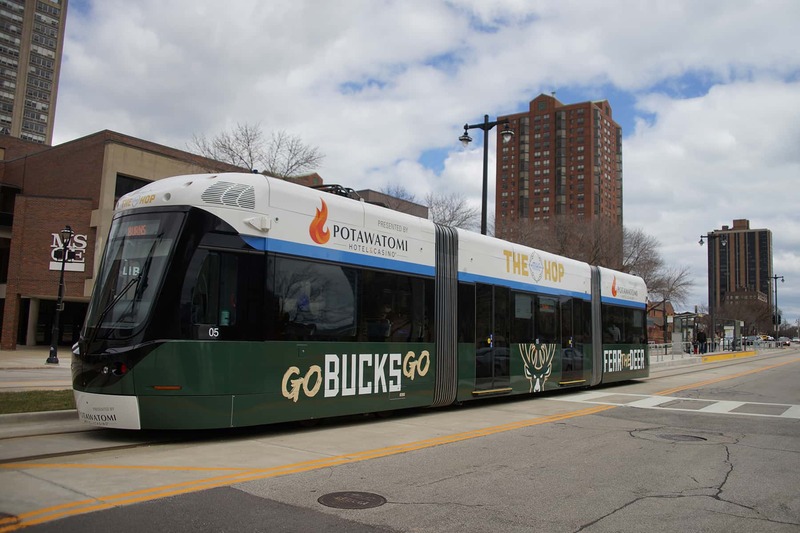 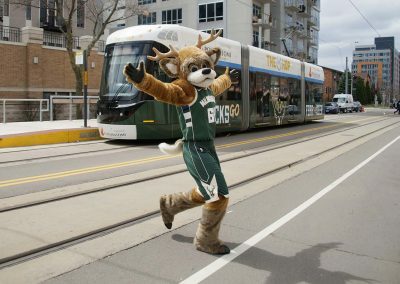 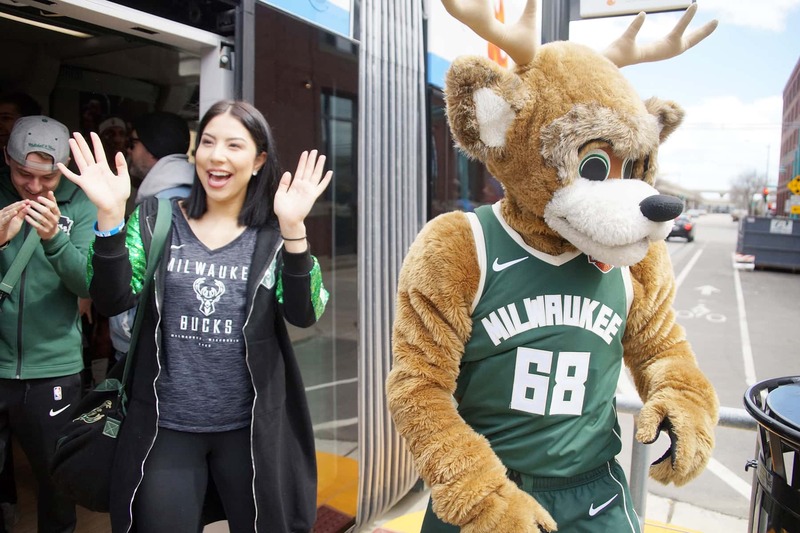 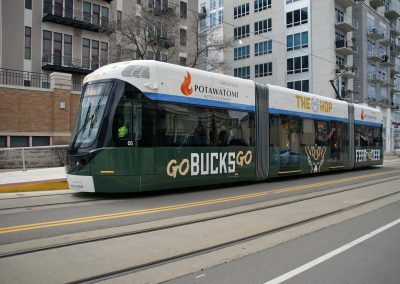 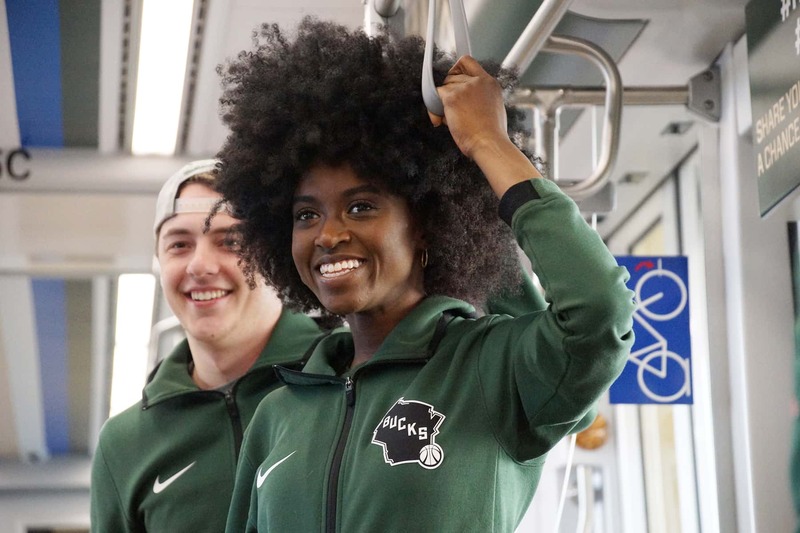 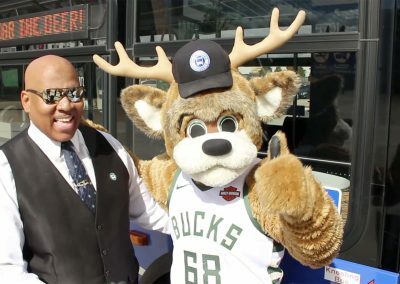 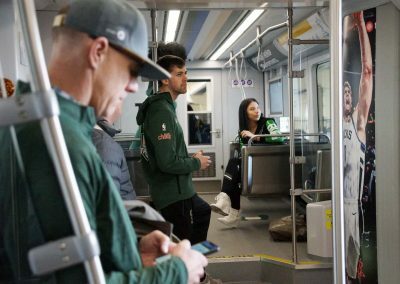 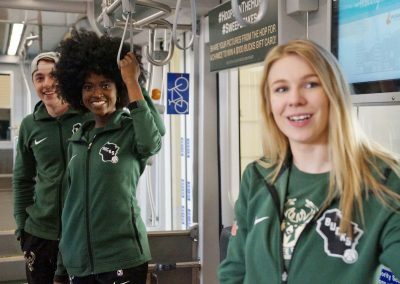 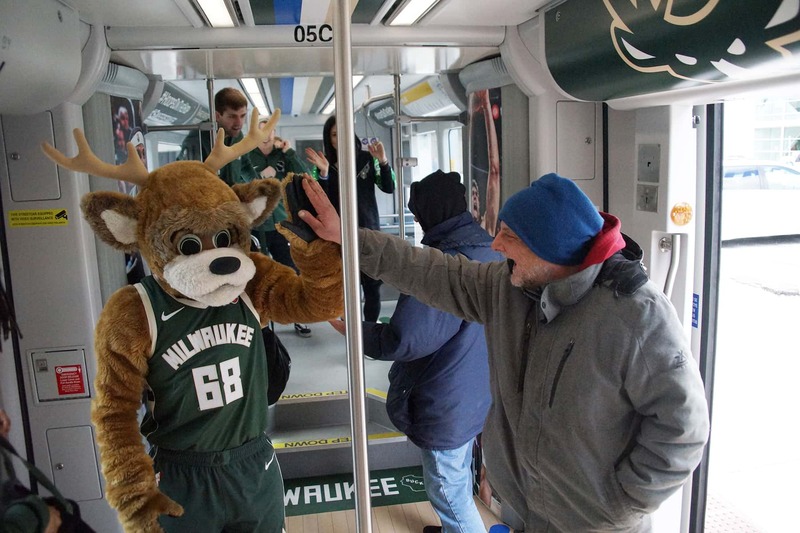 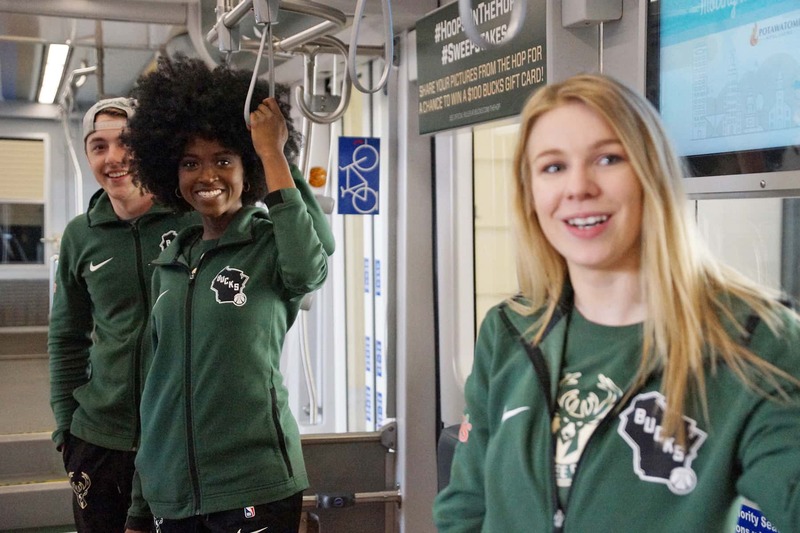 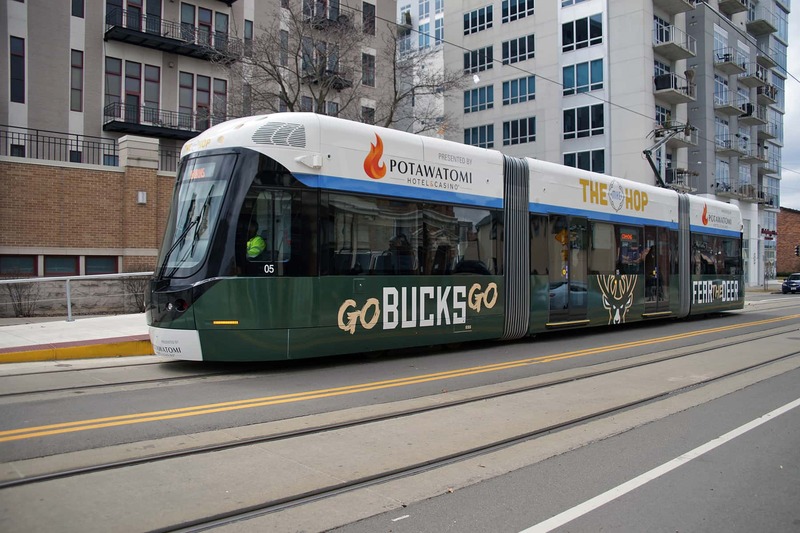 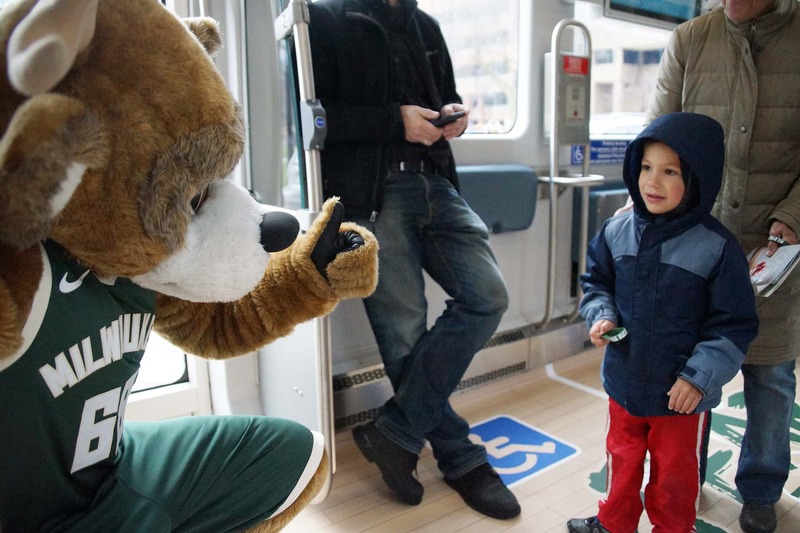 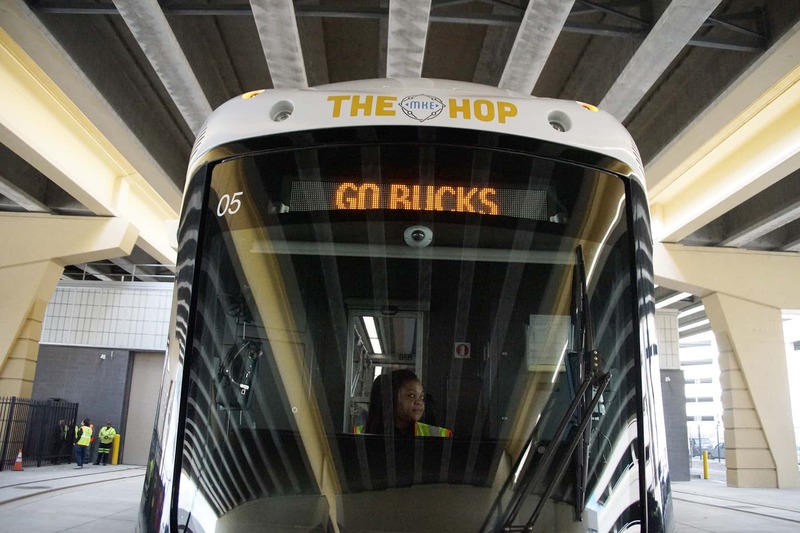 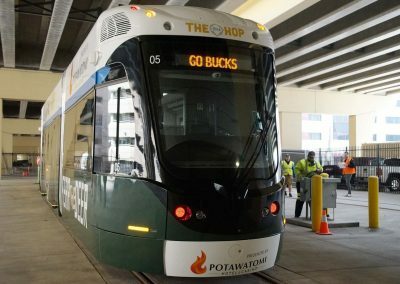 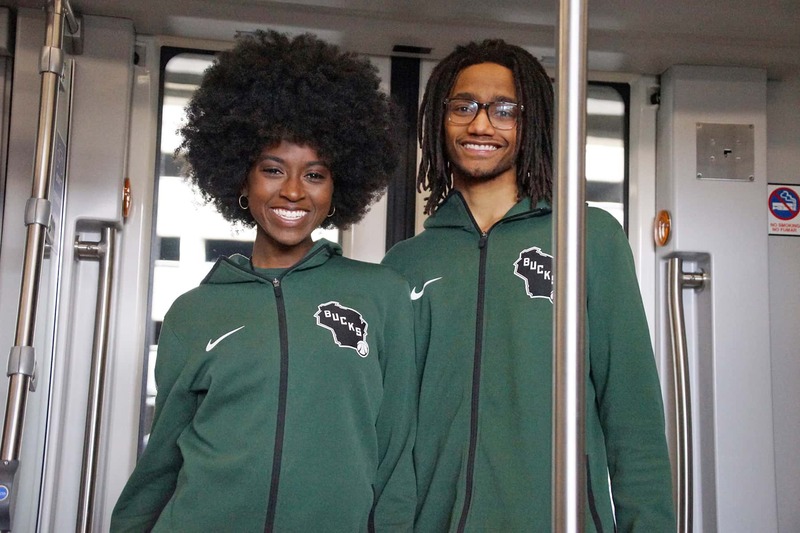 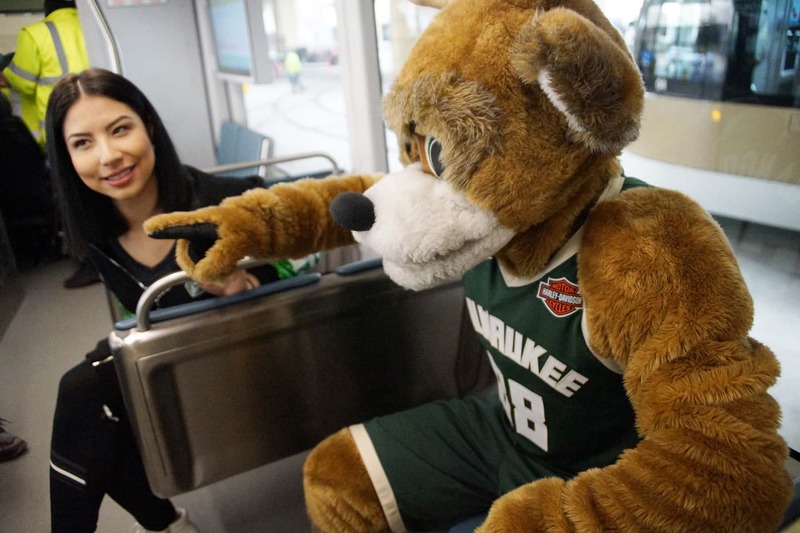 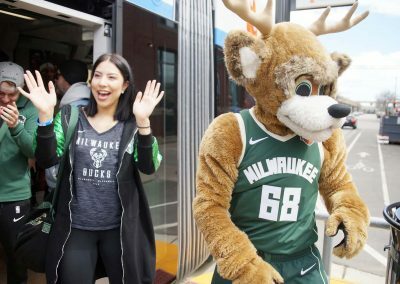 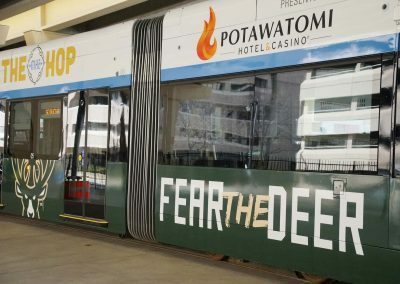 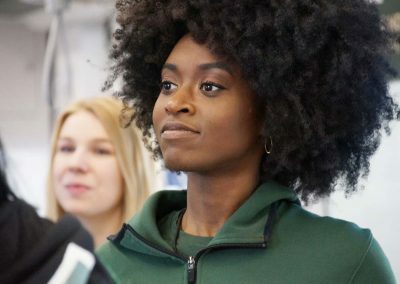 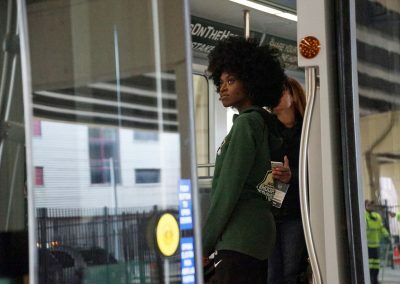 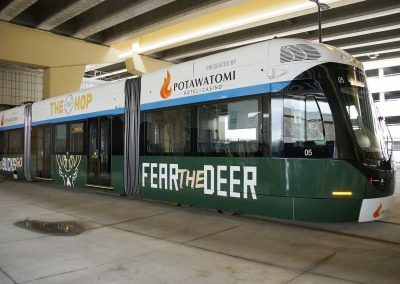 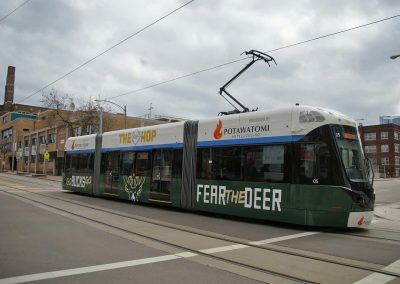 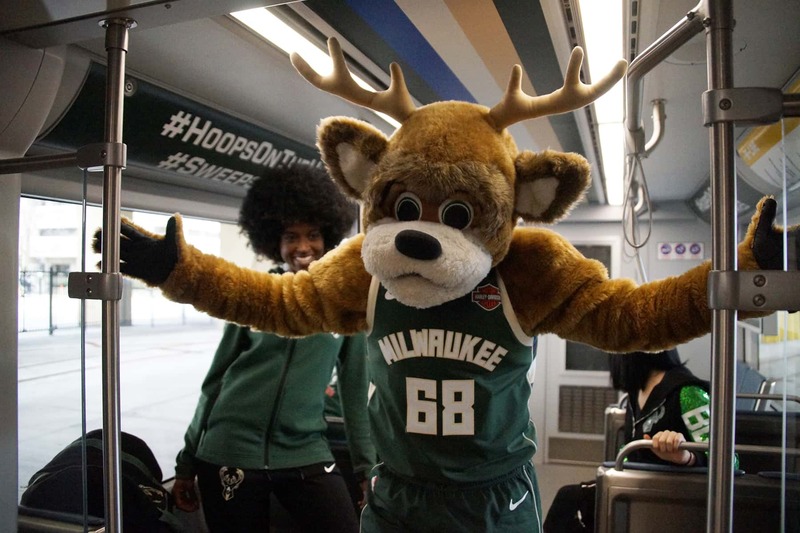 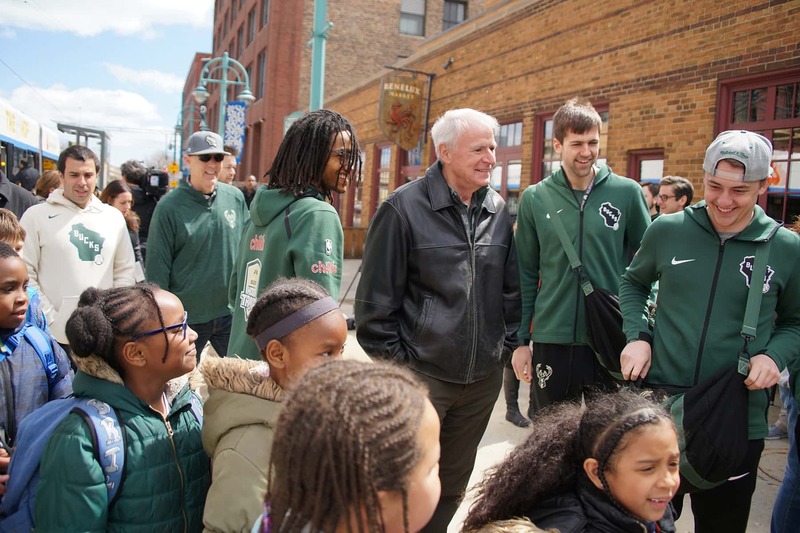 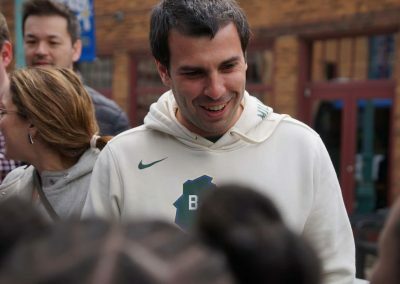 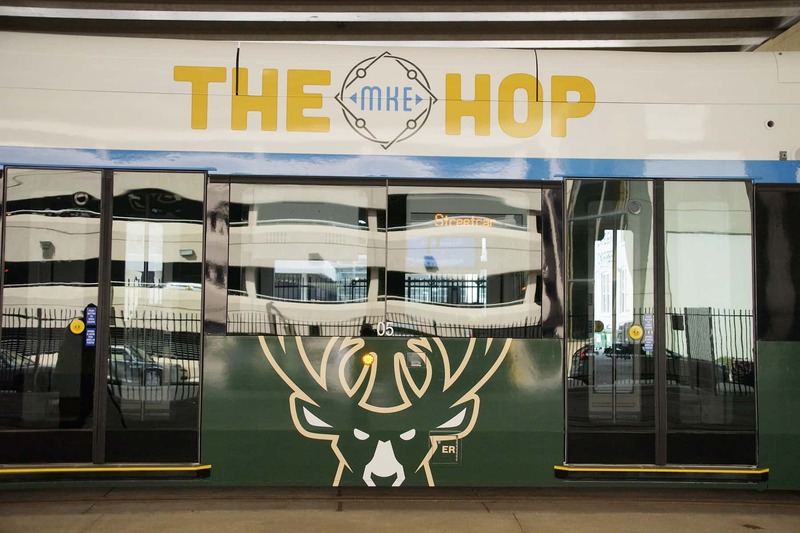 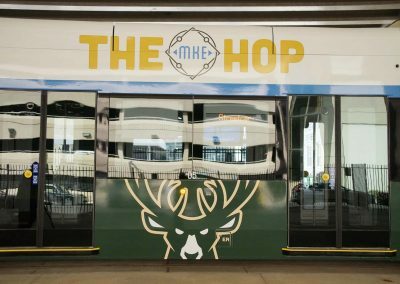 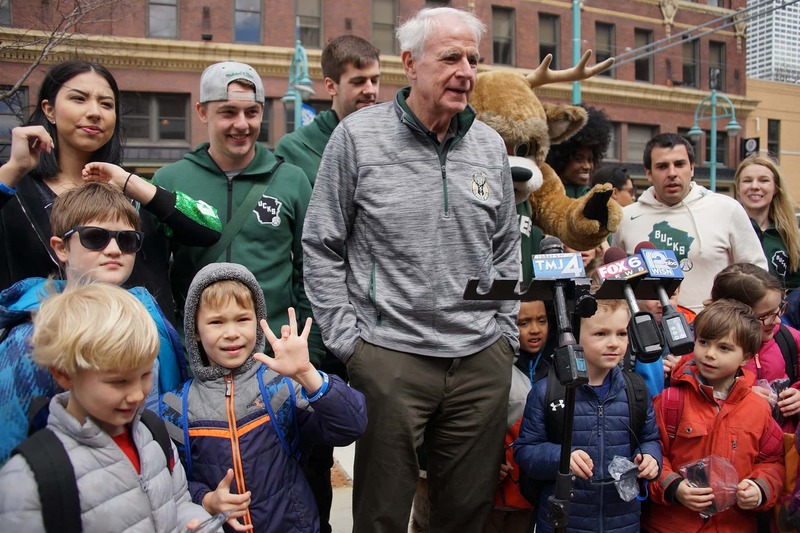 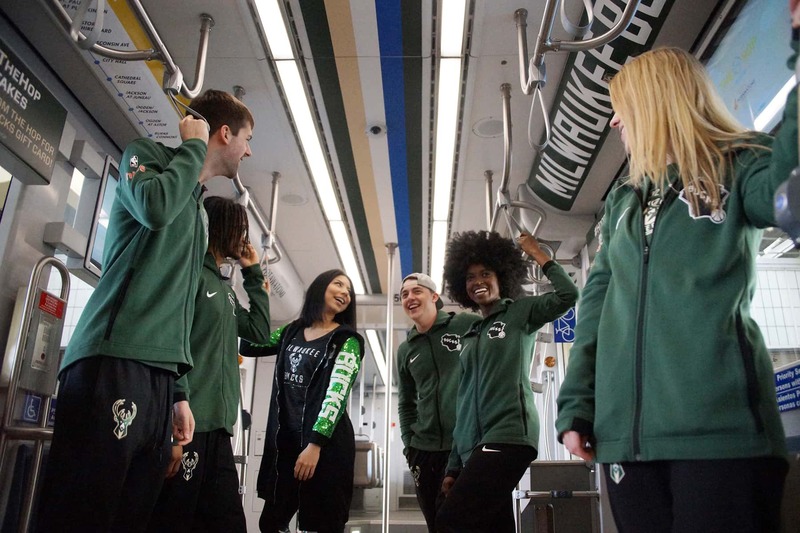 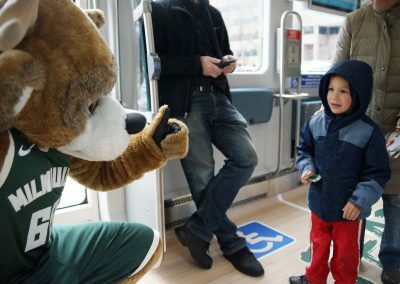 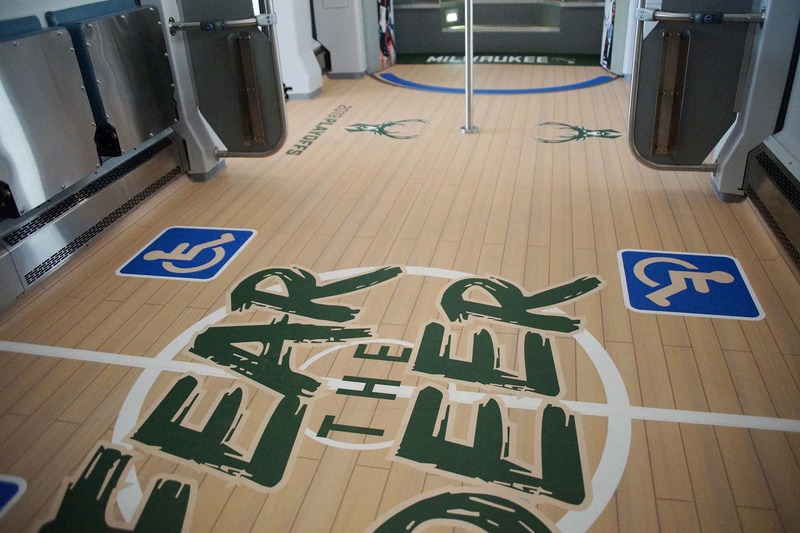 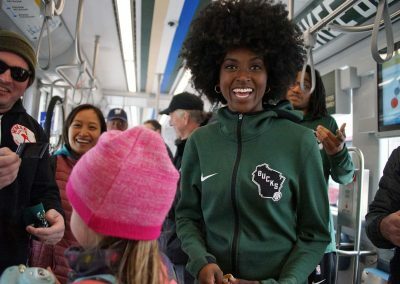 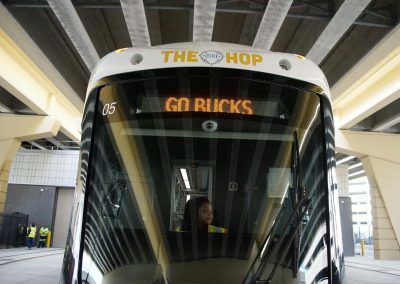 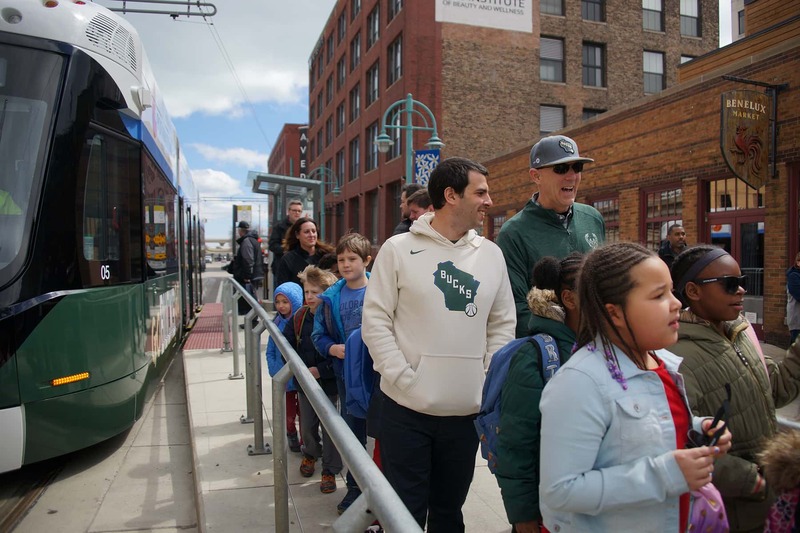 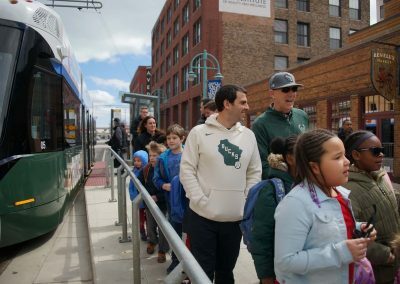 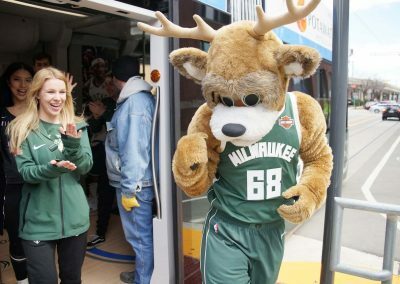 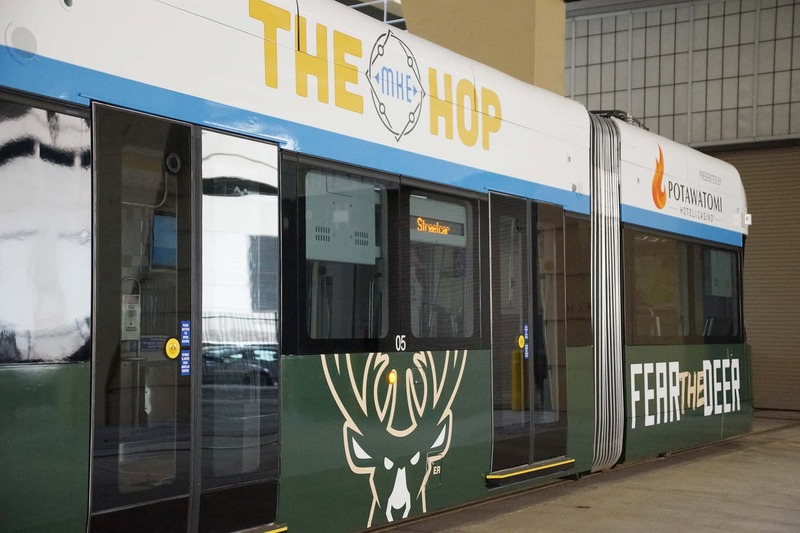 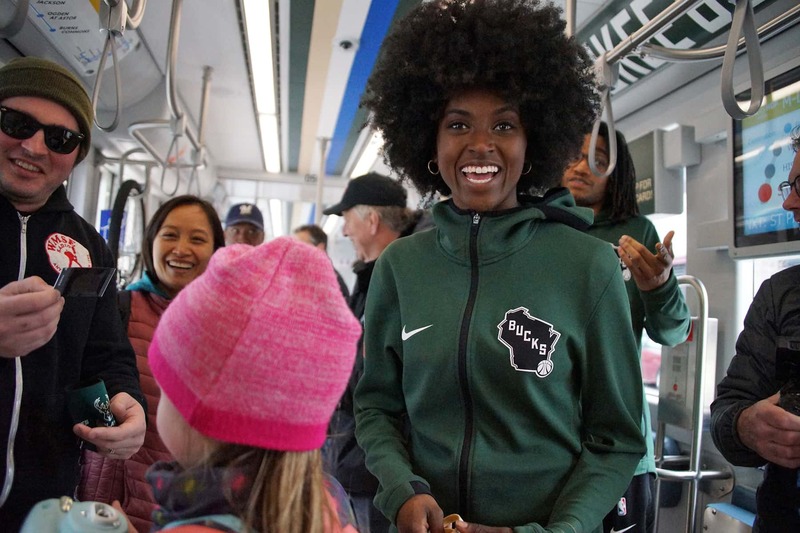 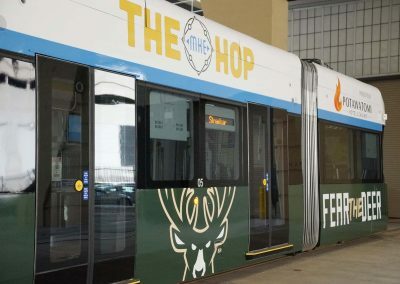 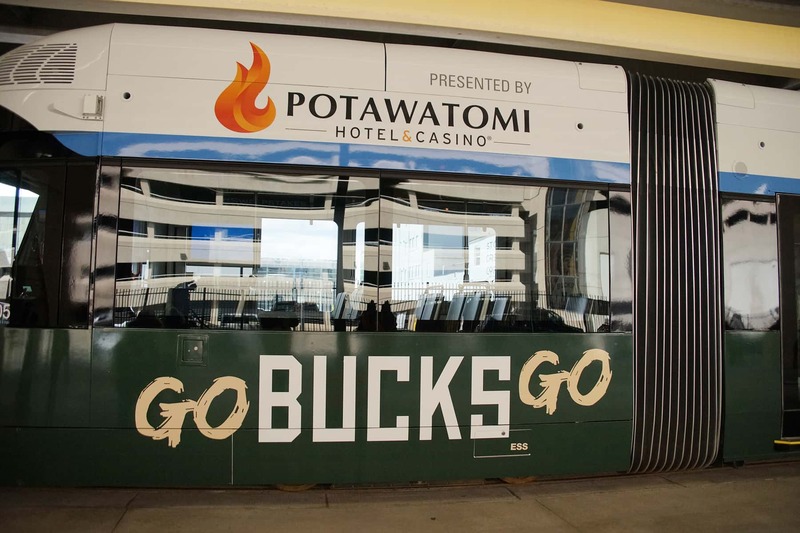 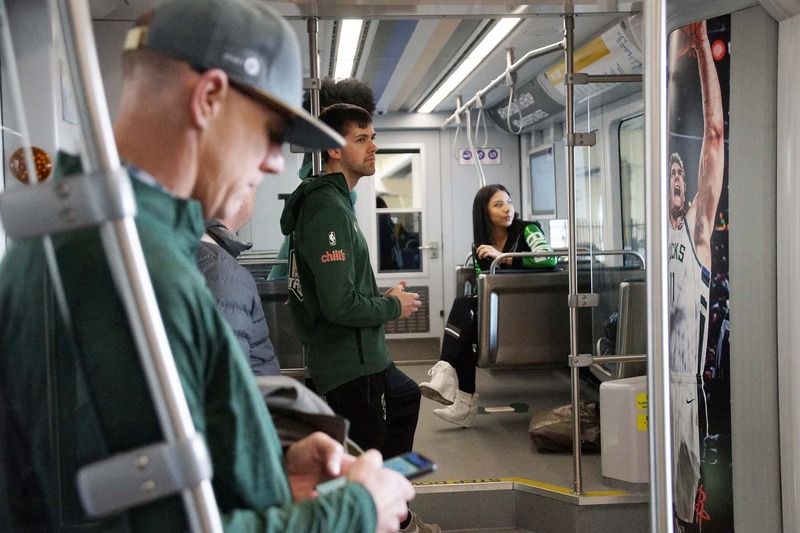 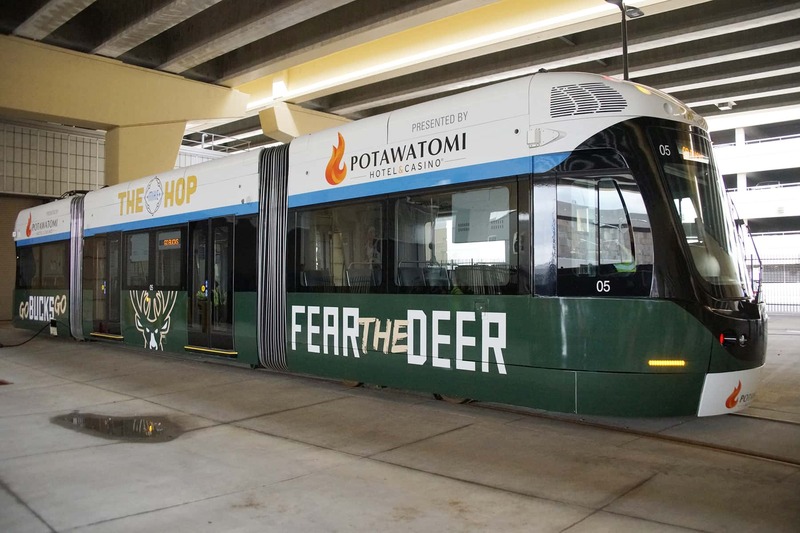 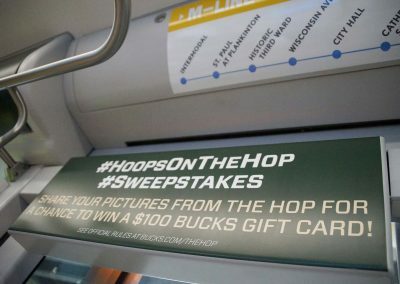 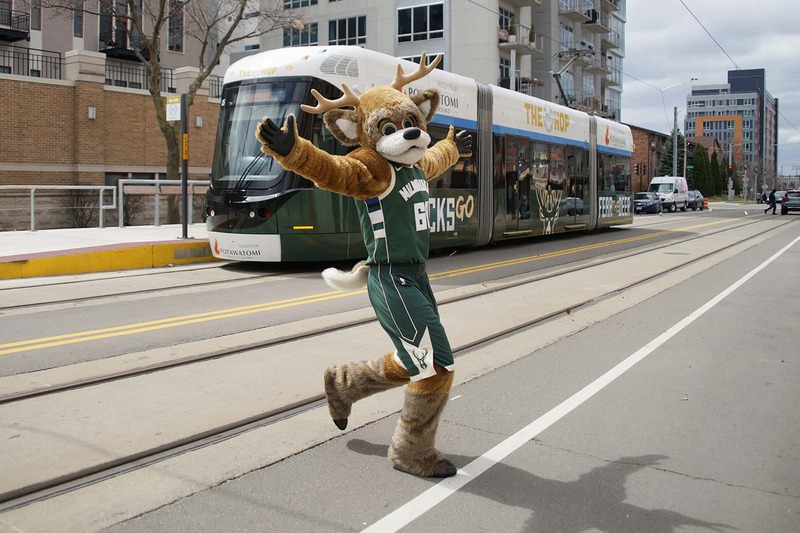 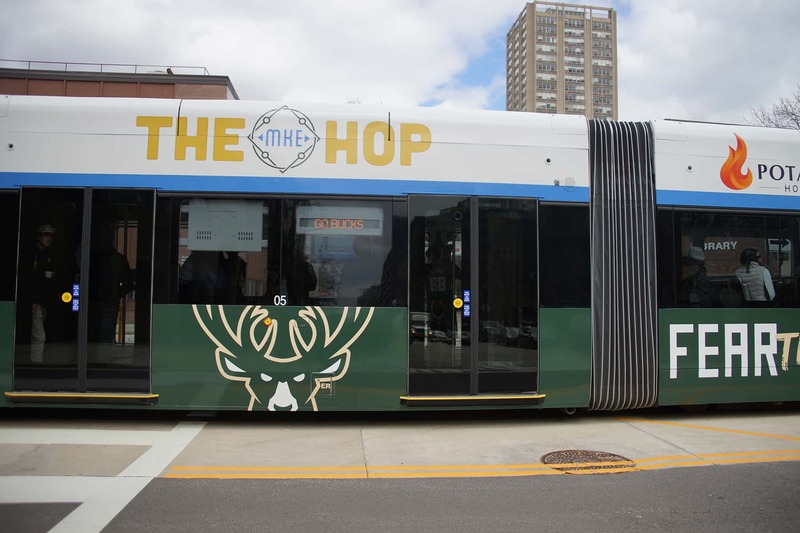 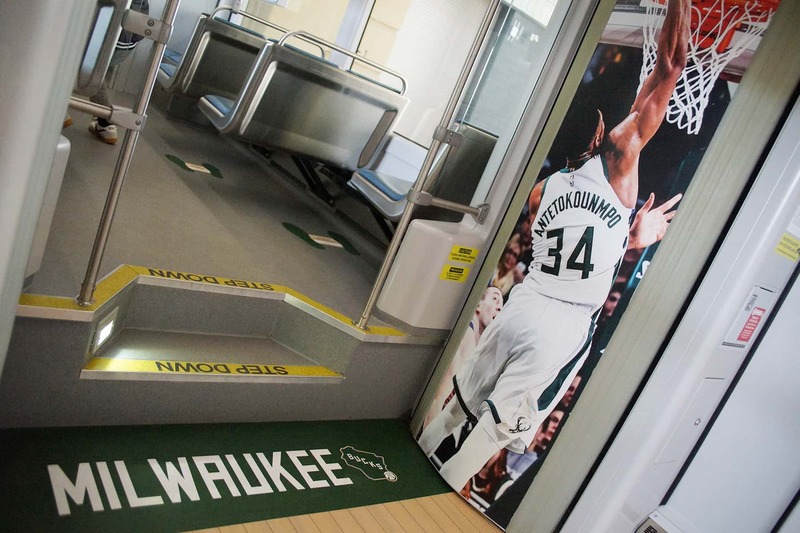 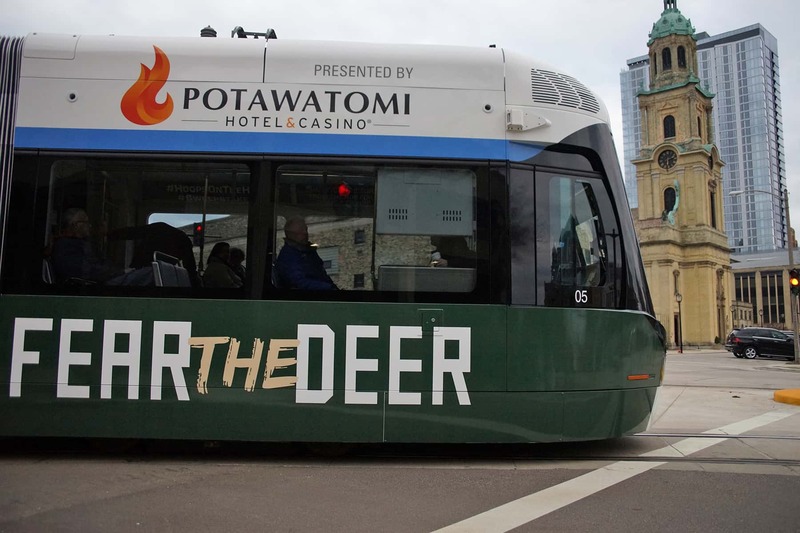 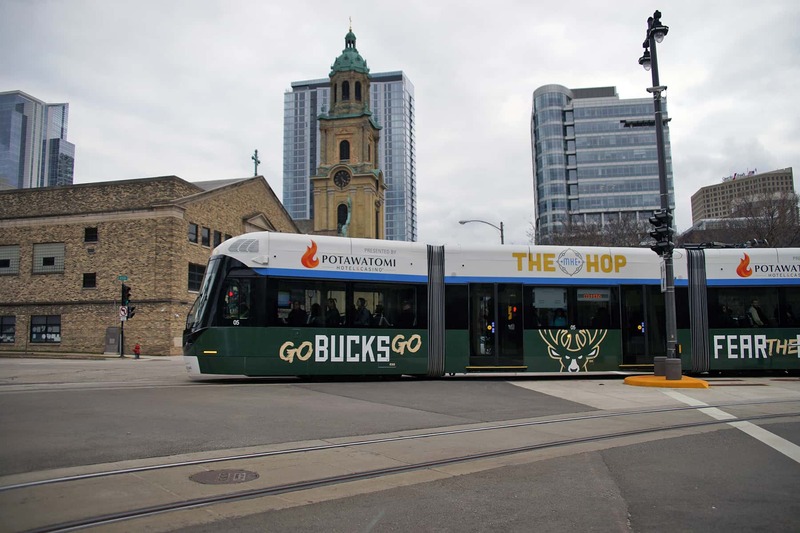 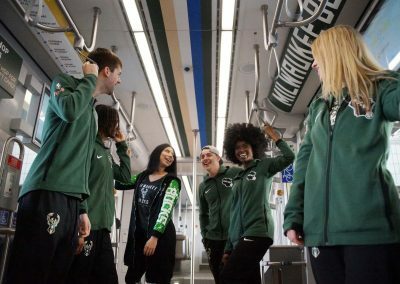 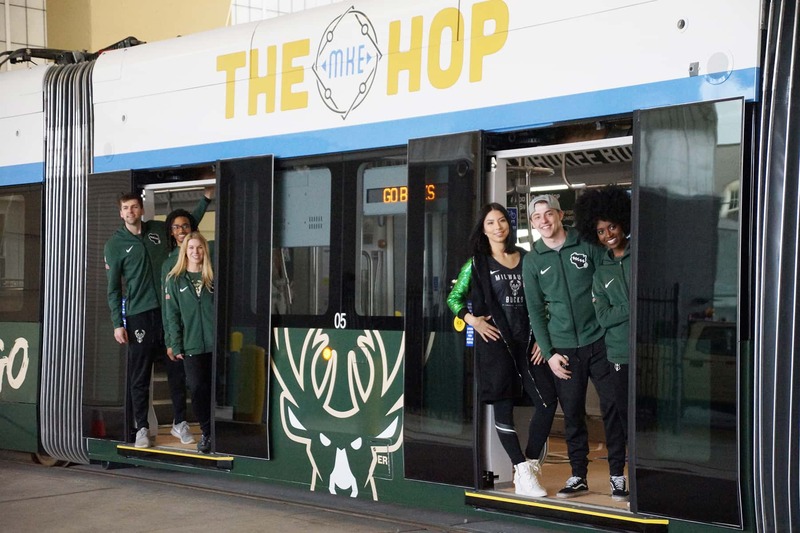 Later in the day on April 12, the Bucks and the city unveiled one of The Hop streetcars adorned with interior and exterior Bucks Playoff branding. 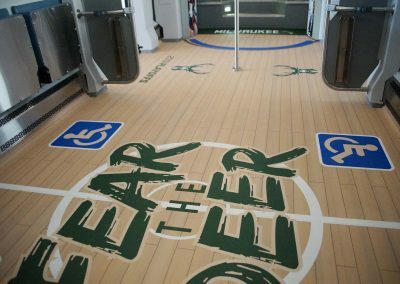 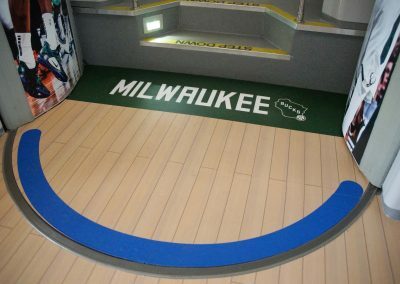 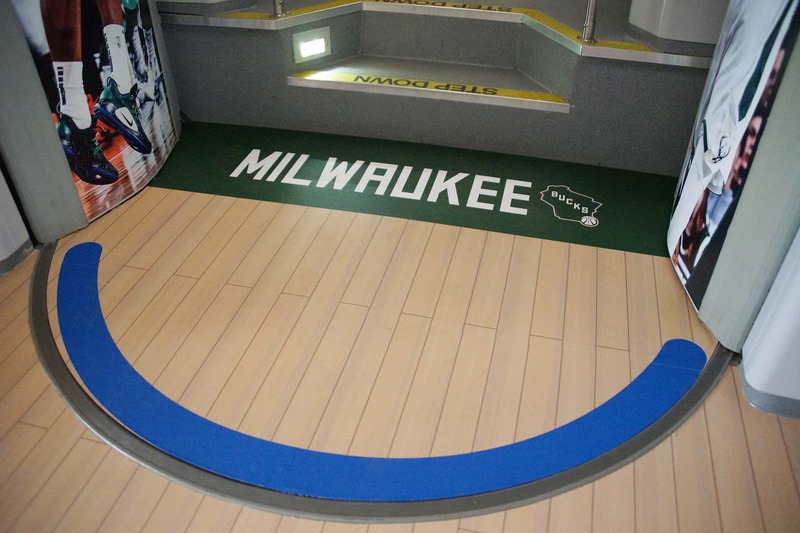 “Fear the Deer” and “Go Bucks Go” signage was displayed outside, with a simulated basketball court inside. 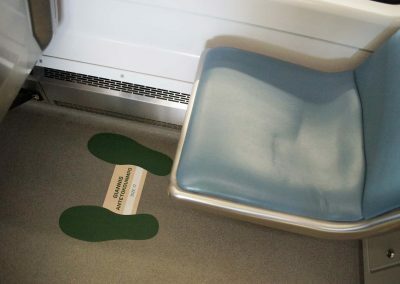 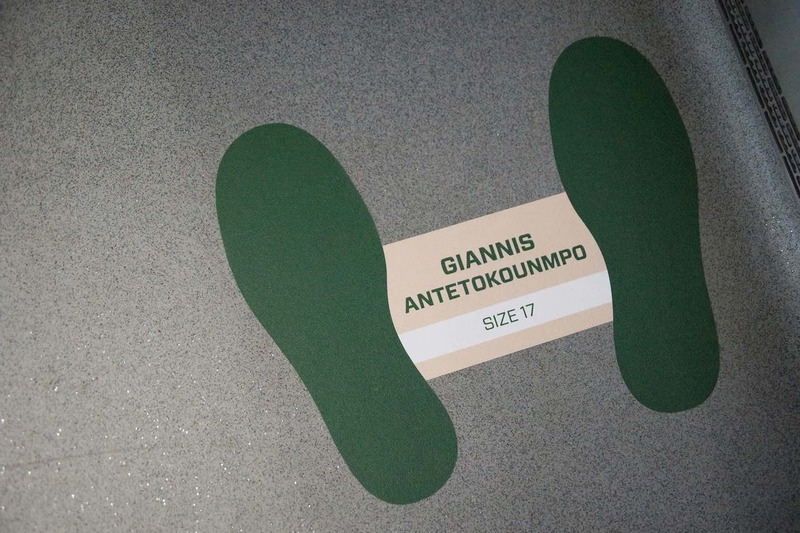 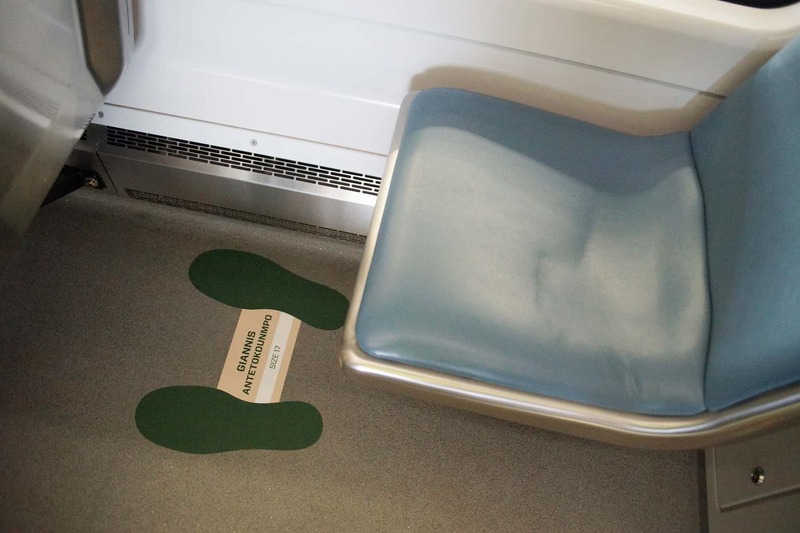 The shoe outlines of Giannis Antetokounmpo and other players were placed by each seat, so passengers could compare their feet size. 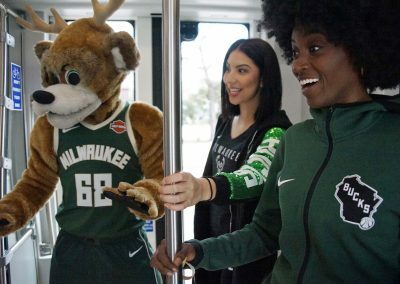 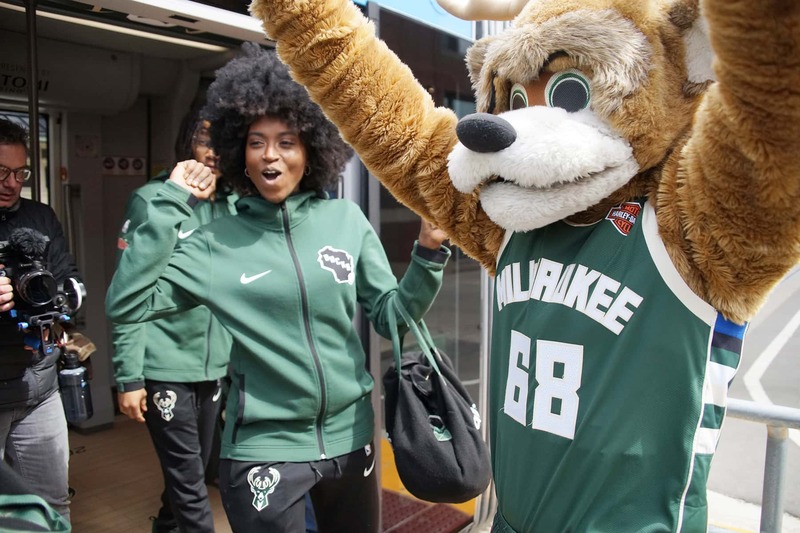 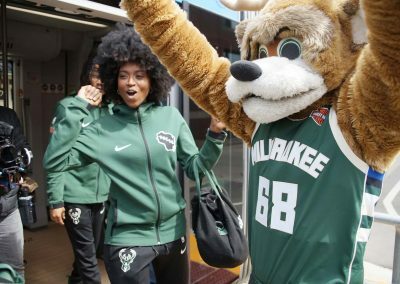 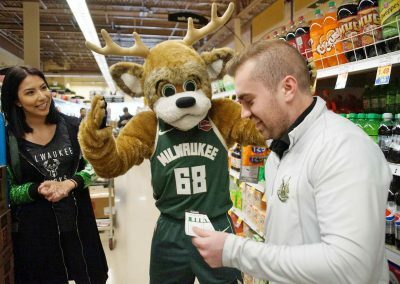 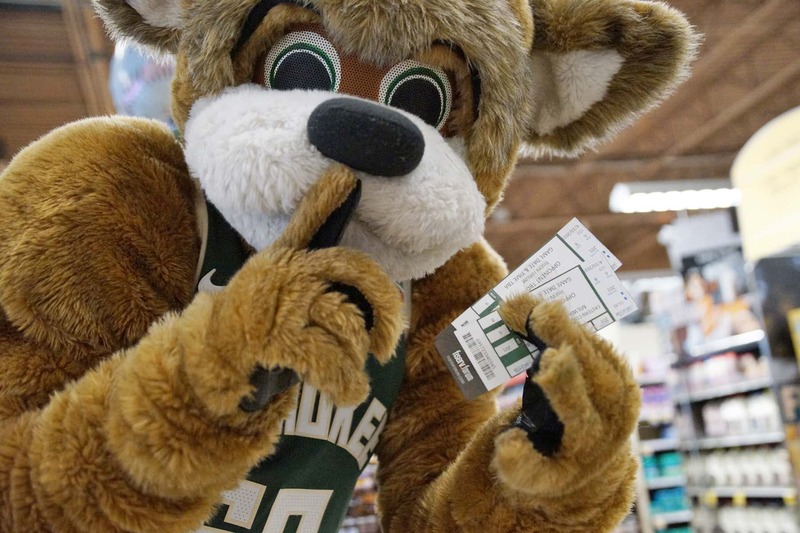 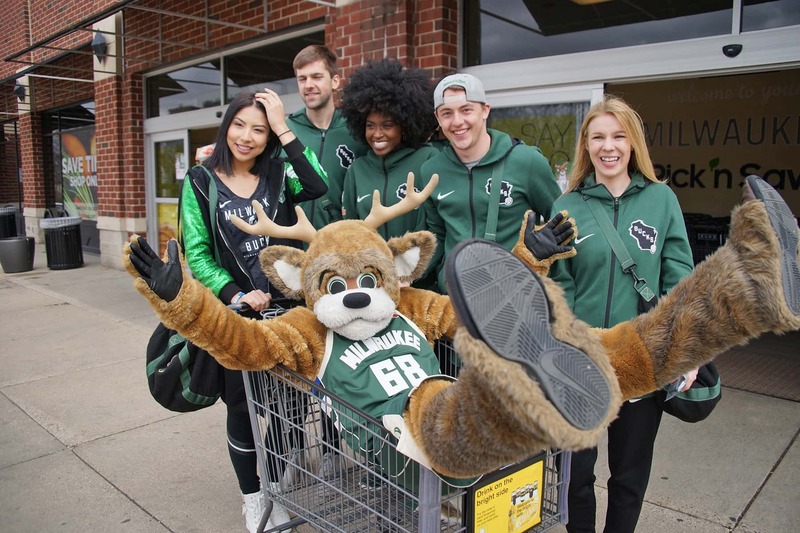 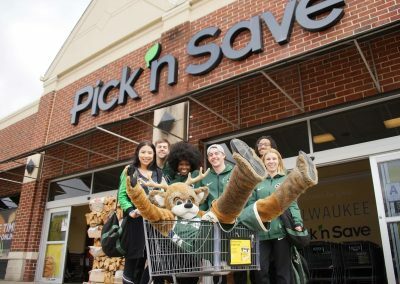 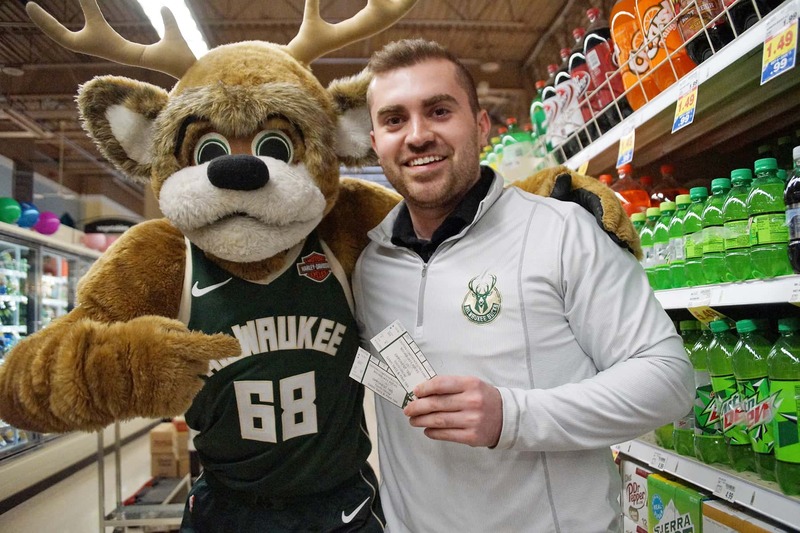 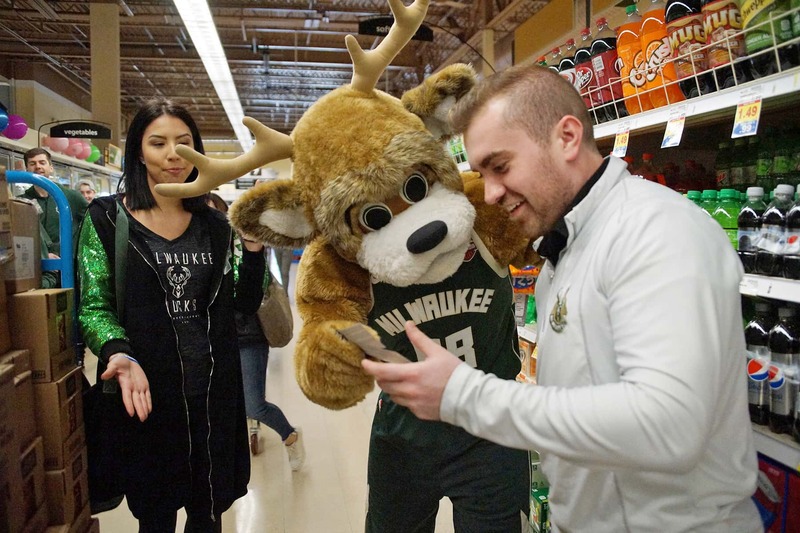 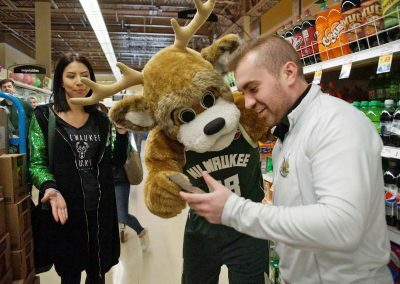 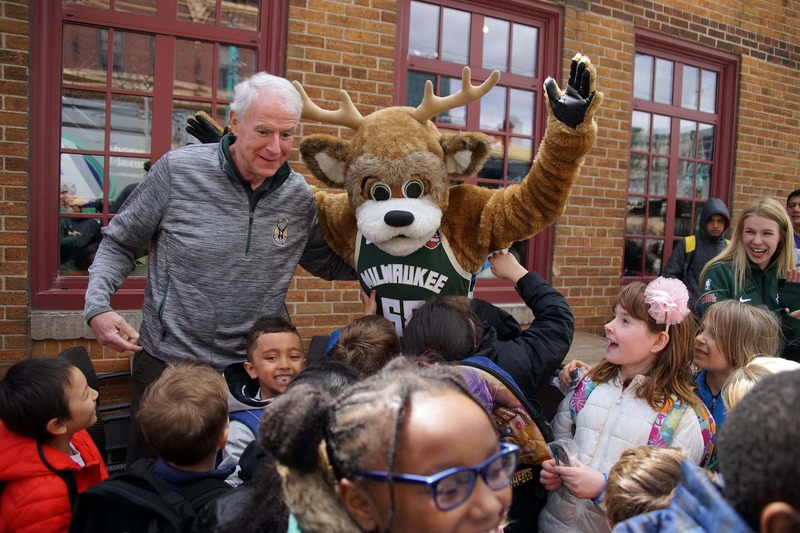 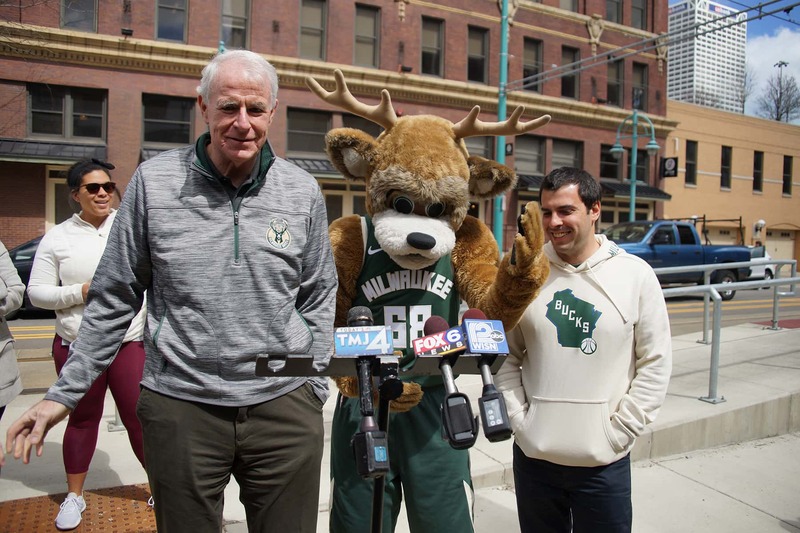 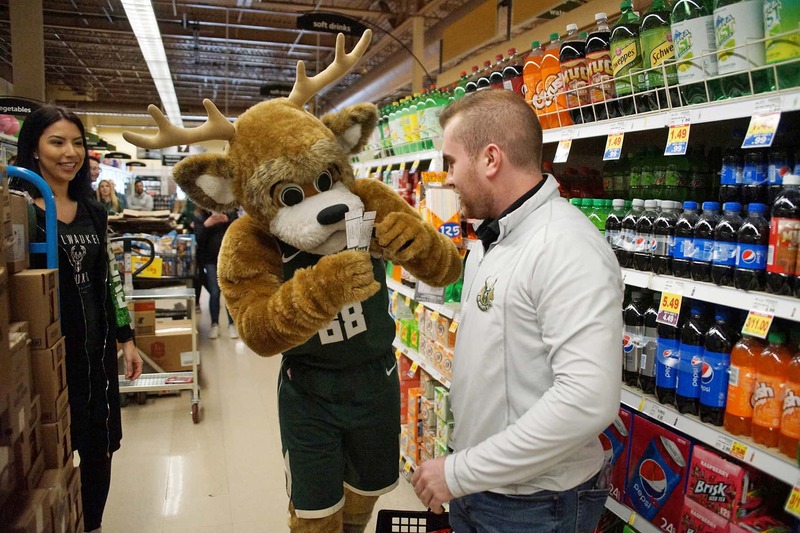 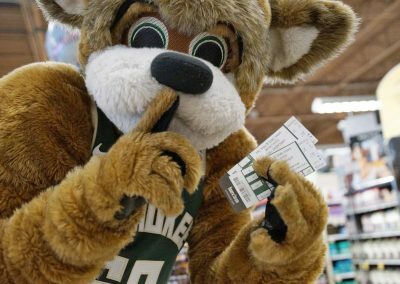 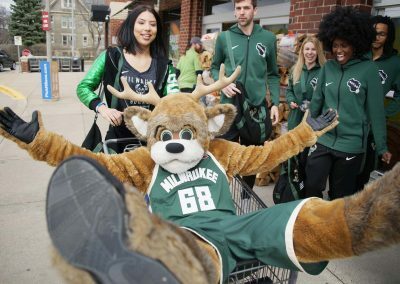 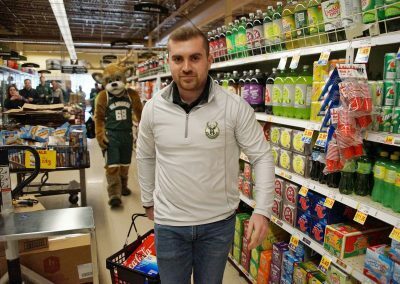 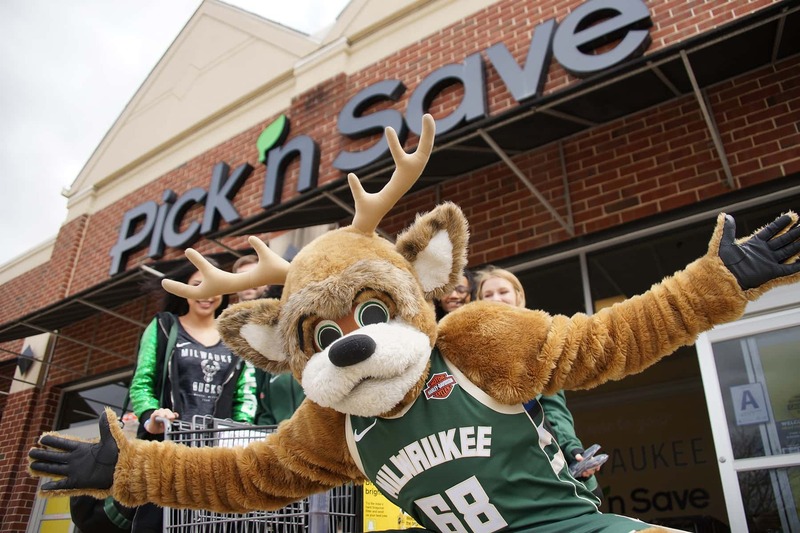 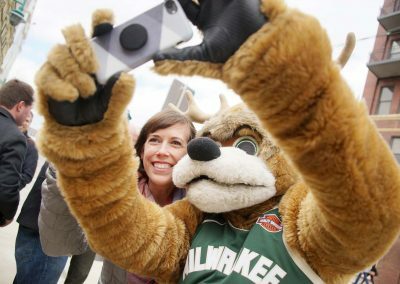 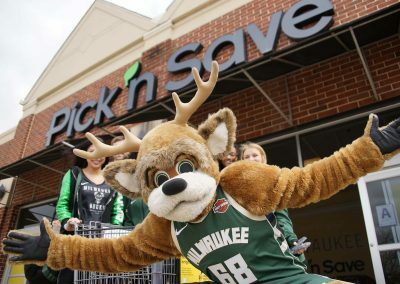 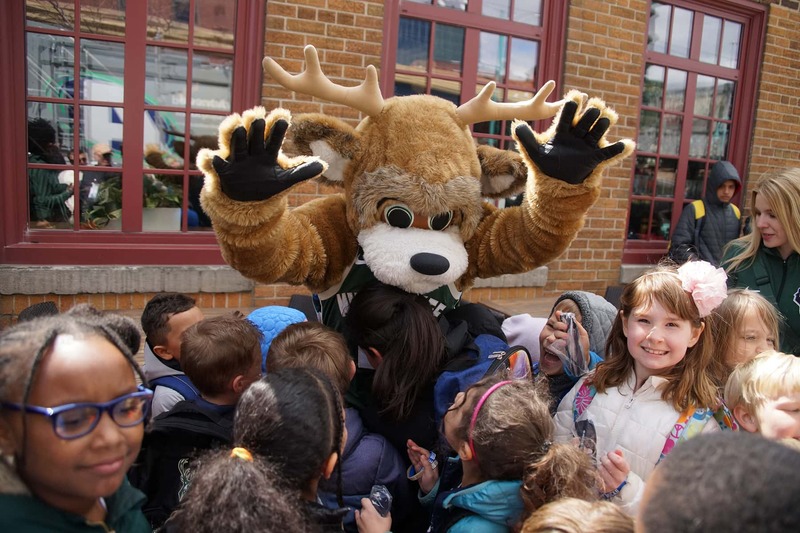 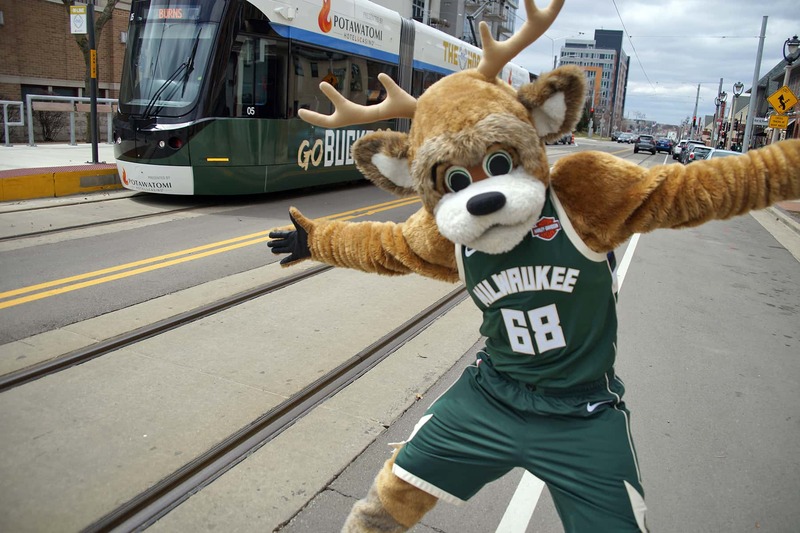 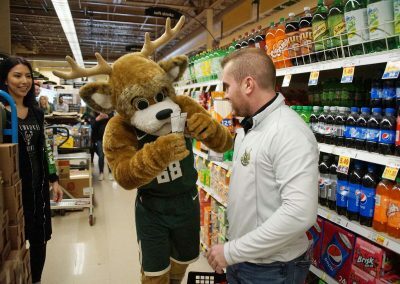 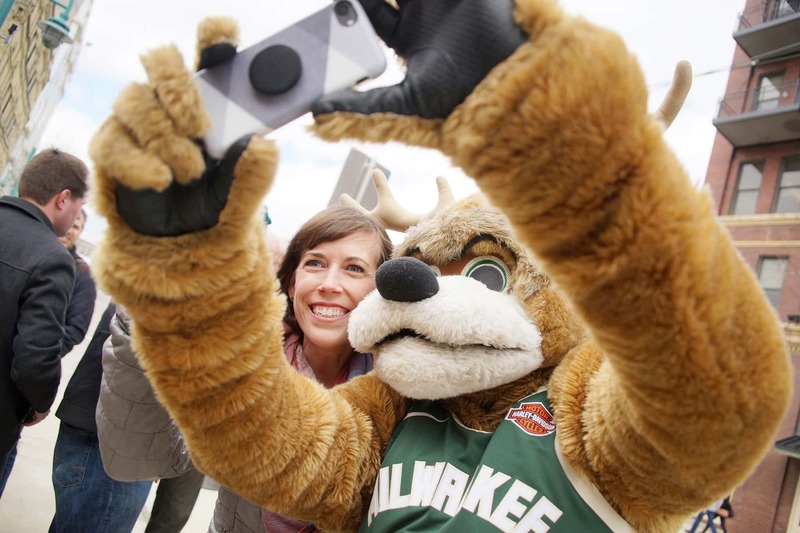 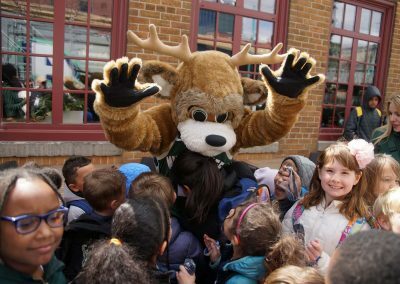 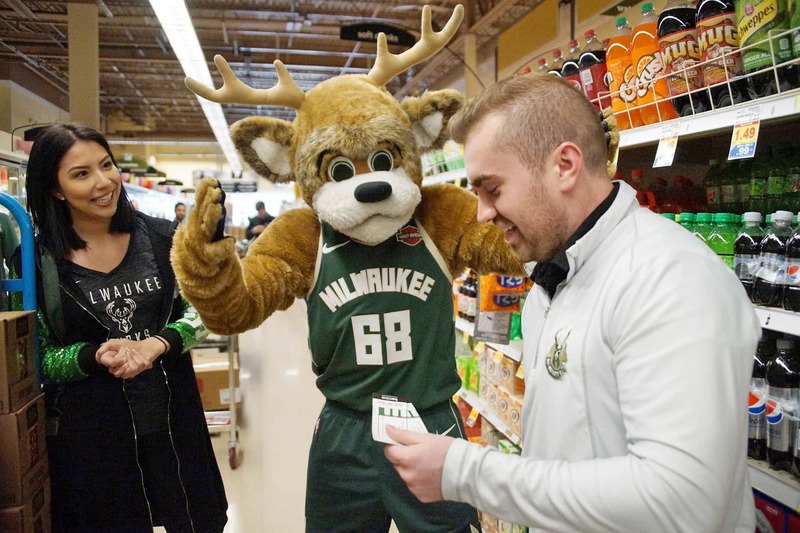 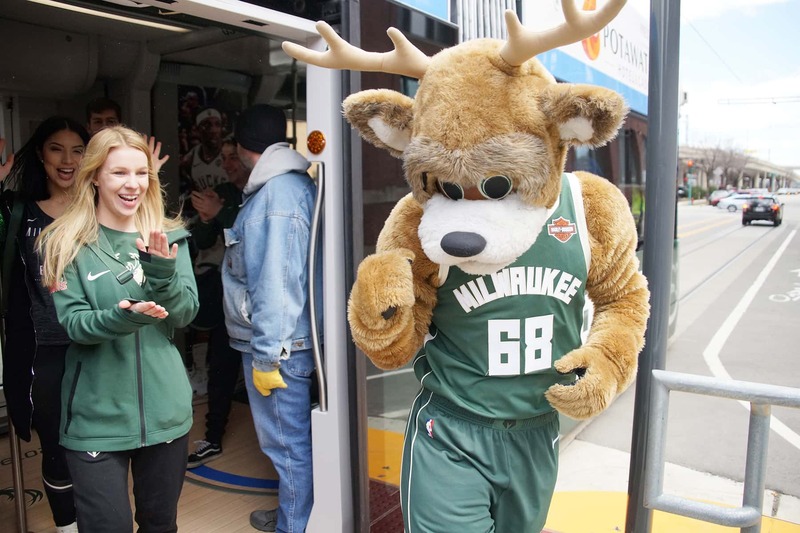 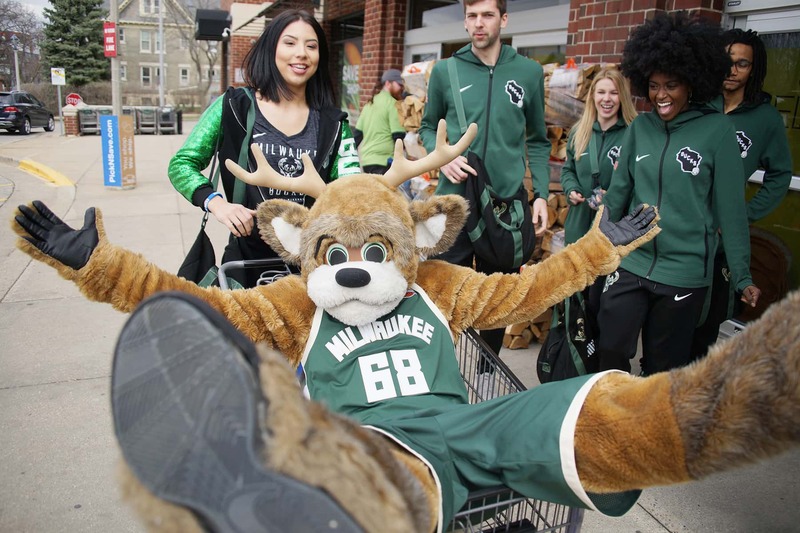 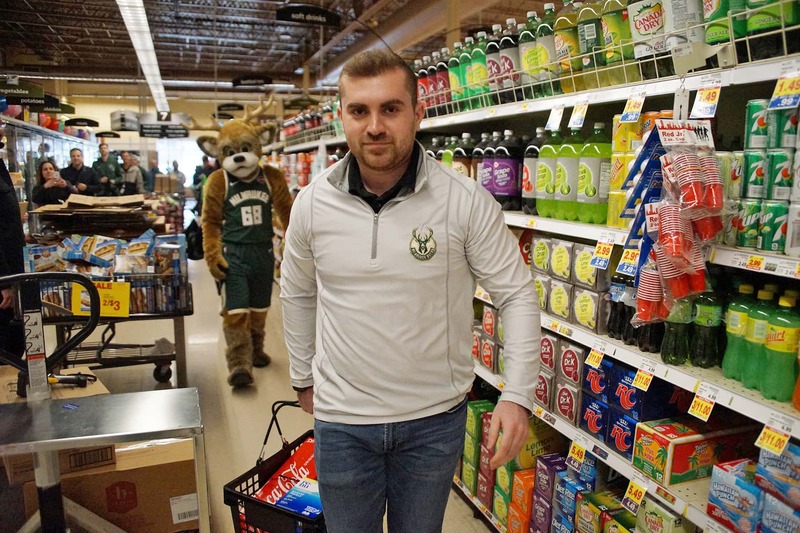 Bango and the Bucks Entertainment Network made surprise visits to businesses along The Hop’s route with give-aways. 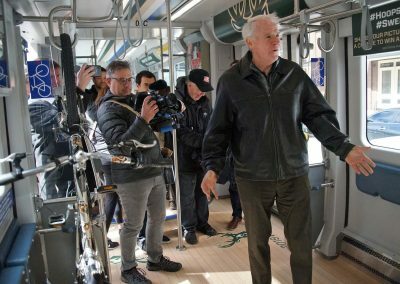 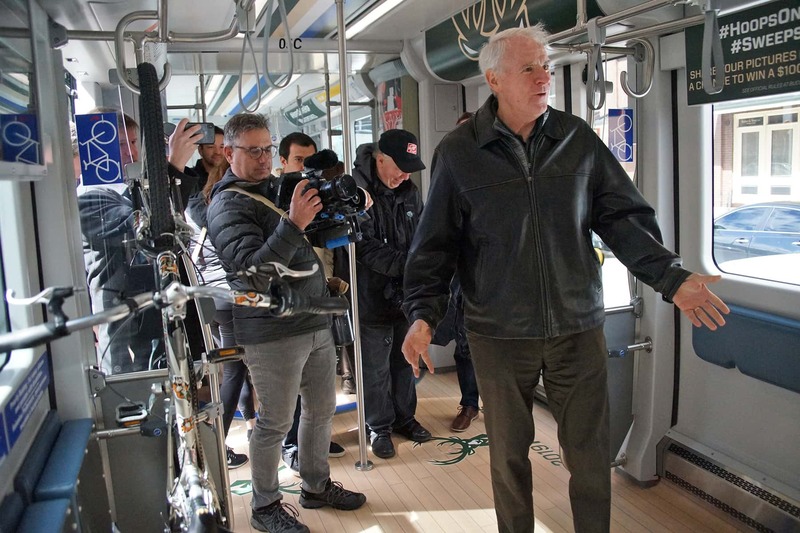 Mayor Barrett and Bucks Senior Vice President Alex Lasry welcomed the streetcar’s debut by the Milwaukee Public Market in the Third Ward. 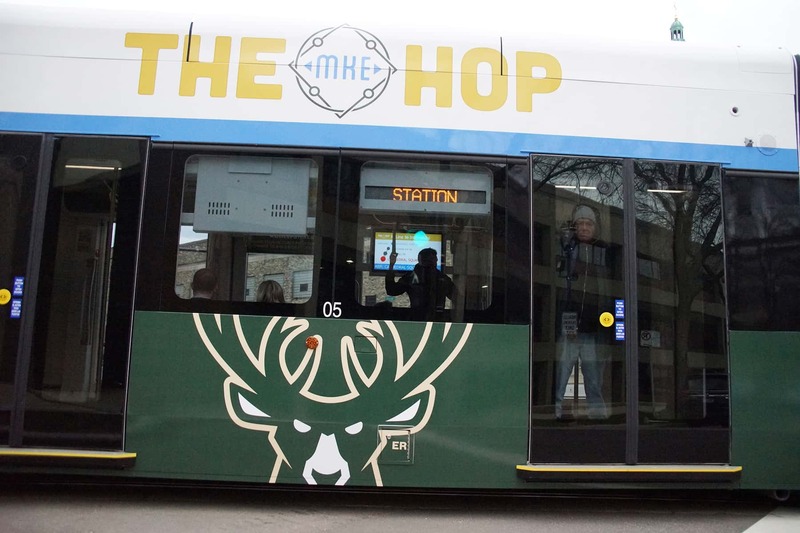 Passengers interested to ride the Bucks clad vehicle can find “Bus 5” on The Hop’s realtime route tracker. 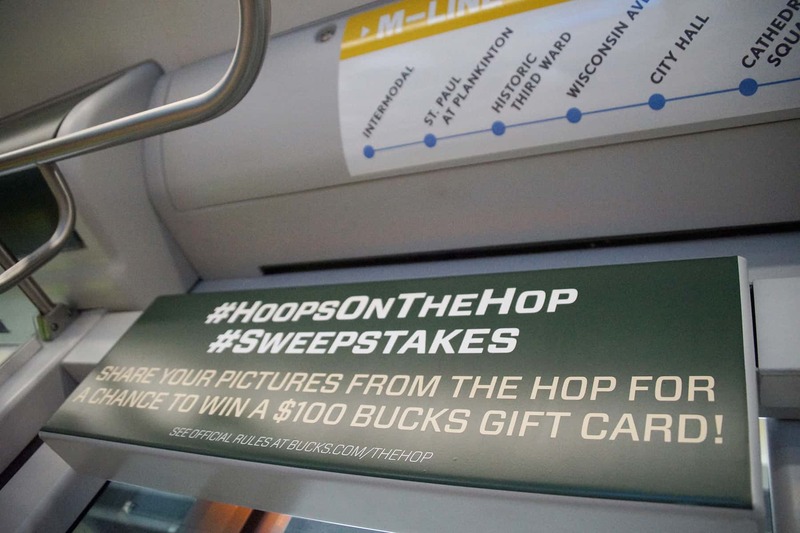 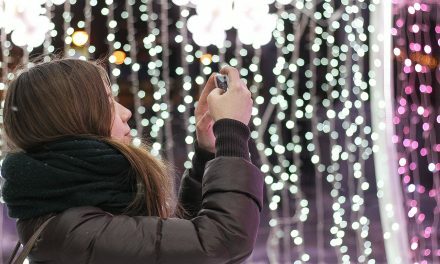 Prizes will also be offered for taking photos in the special streetcar and sharing them on social media. 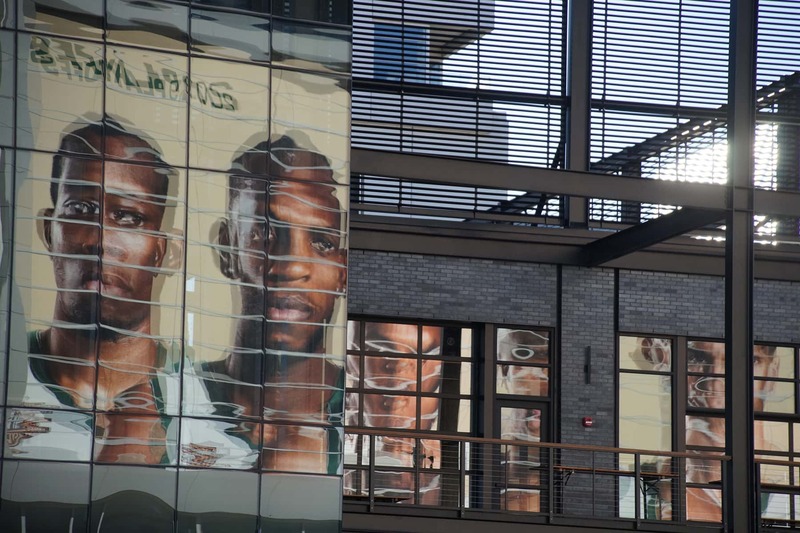 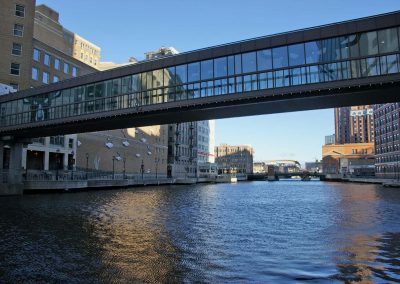 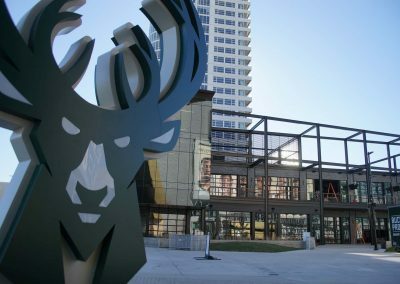 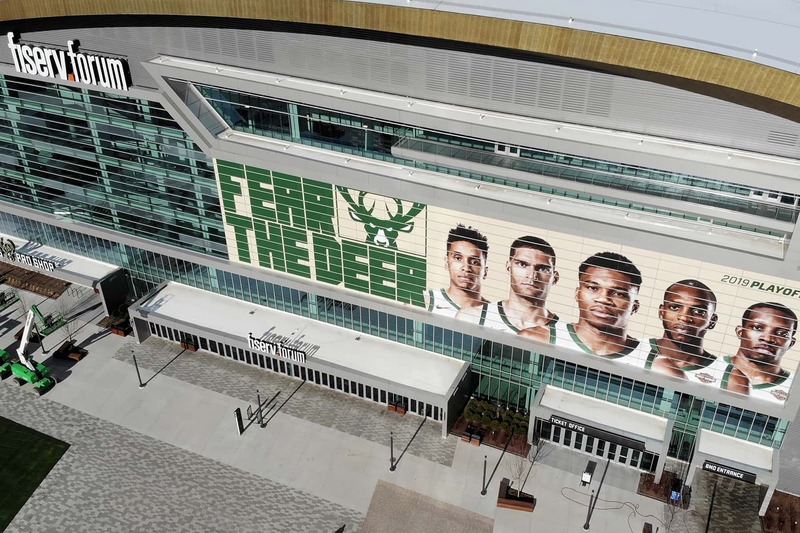 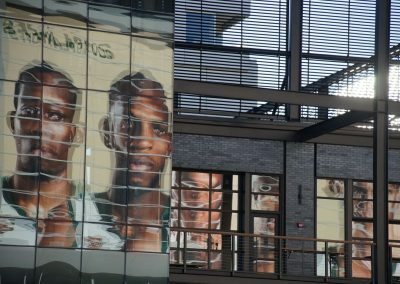 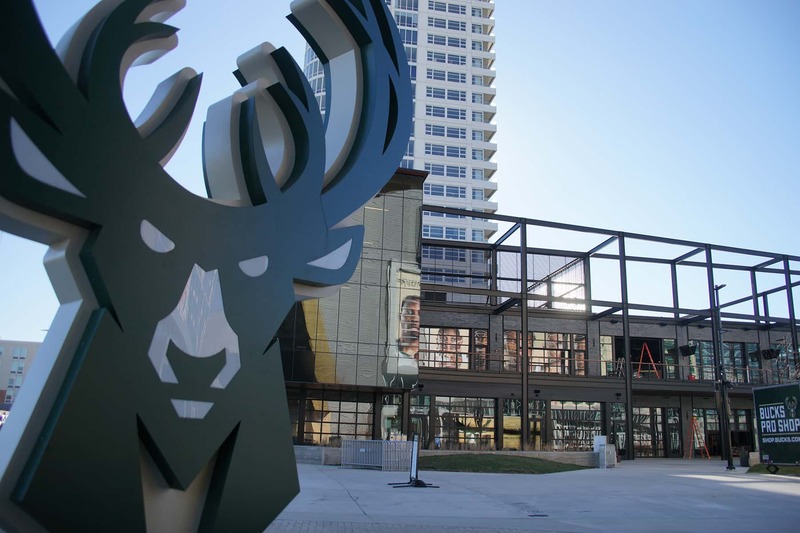 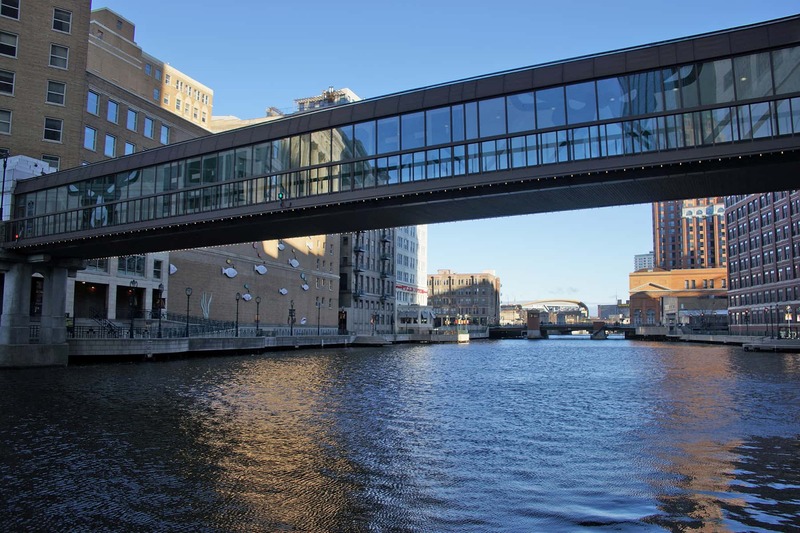 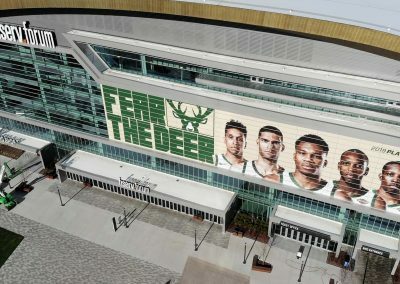 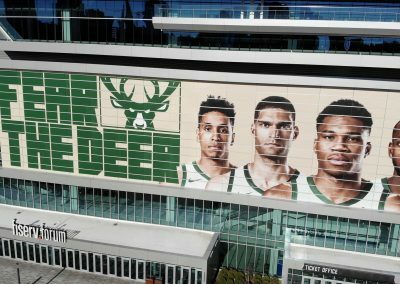 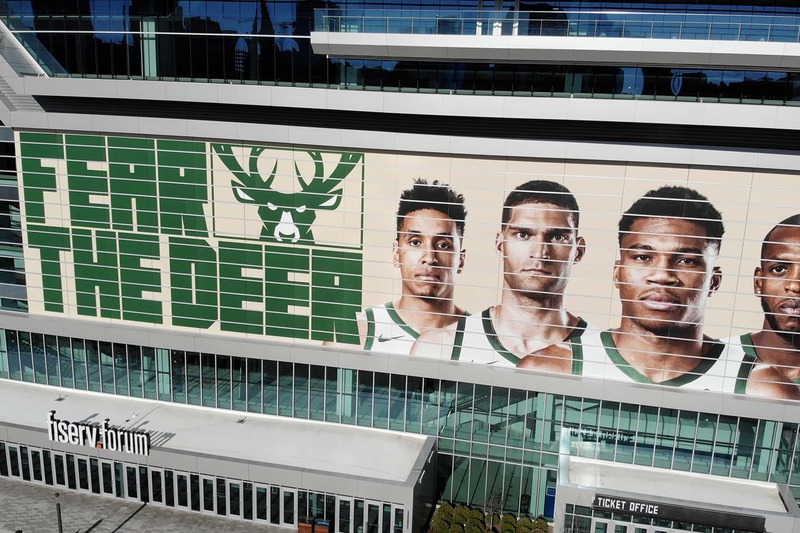 Additionally, the Bucks wrapped two skybridges attached to the building at 100 E. Wisconsin Avenue with Playoff branding, one over Water Street and one over the Milwaukee River. 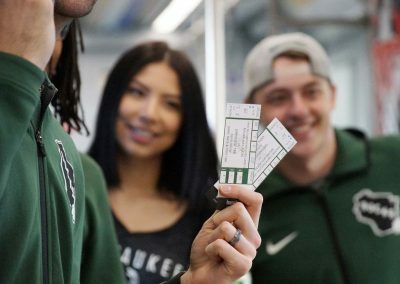 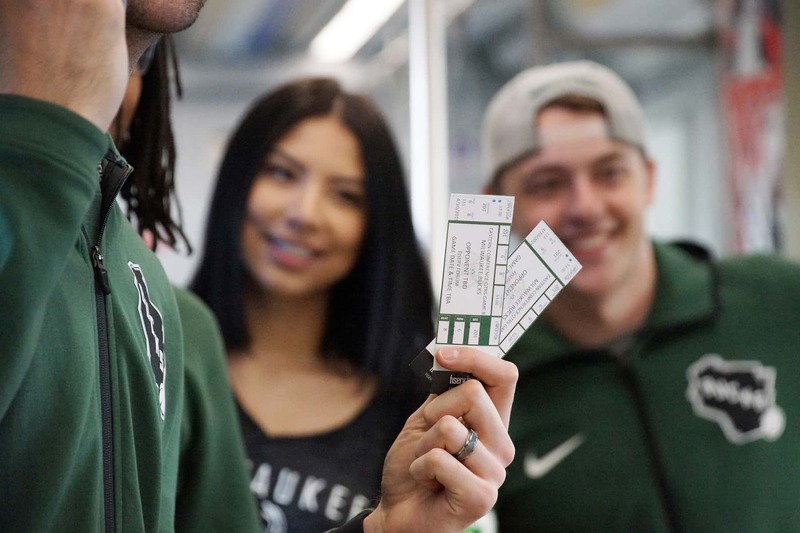 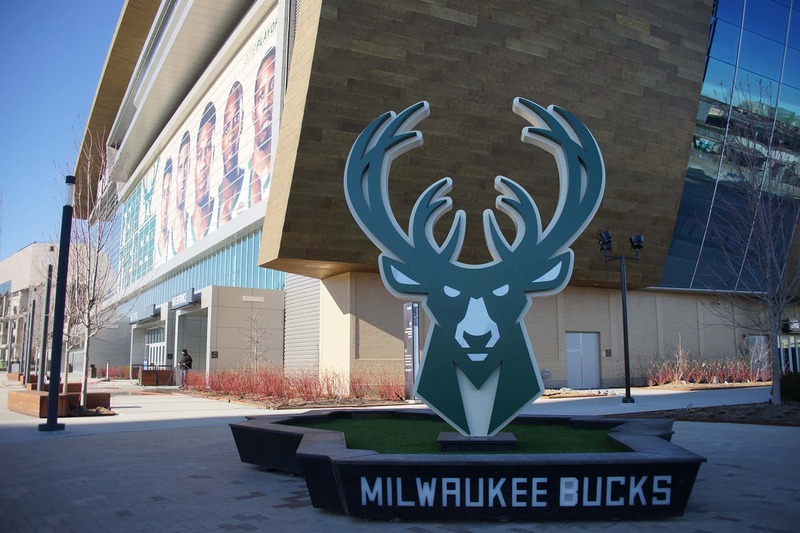 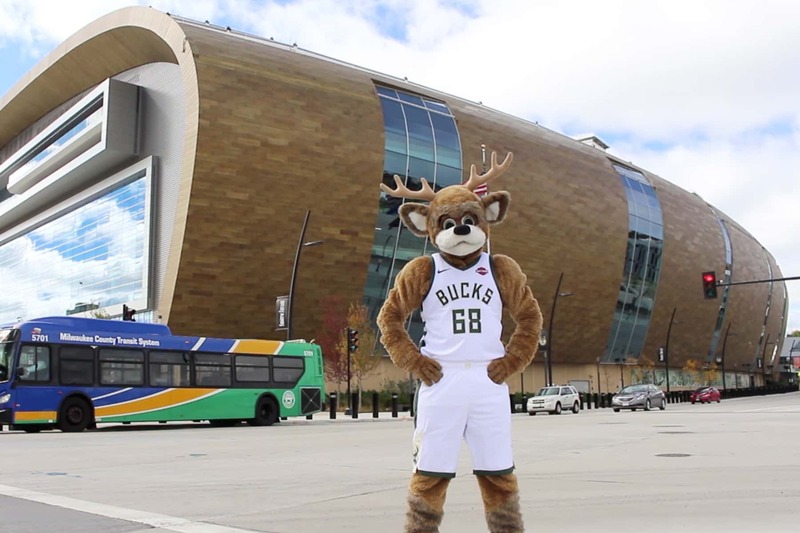 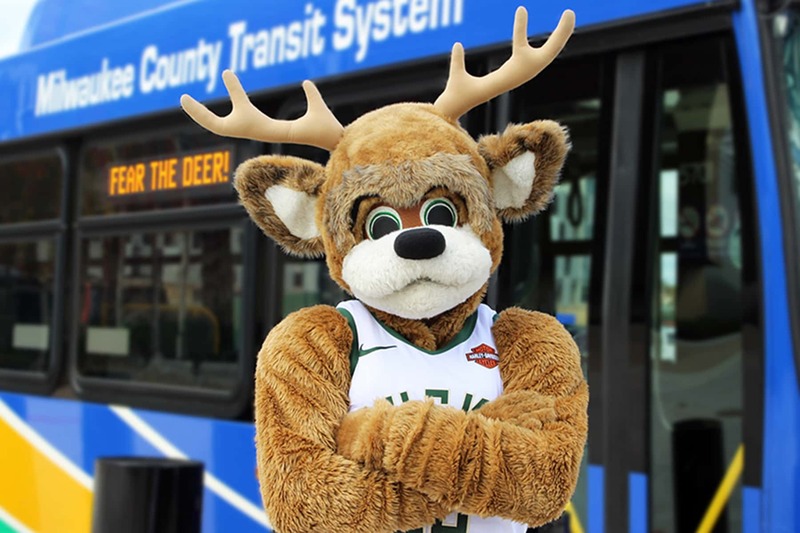 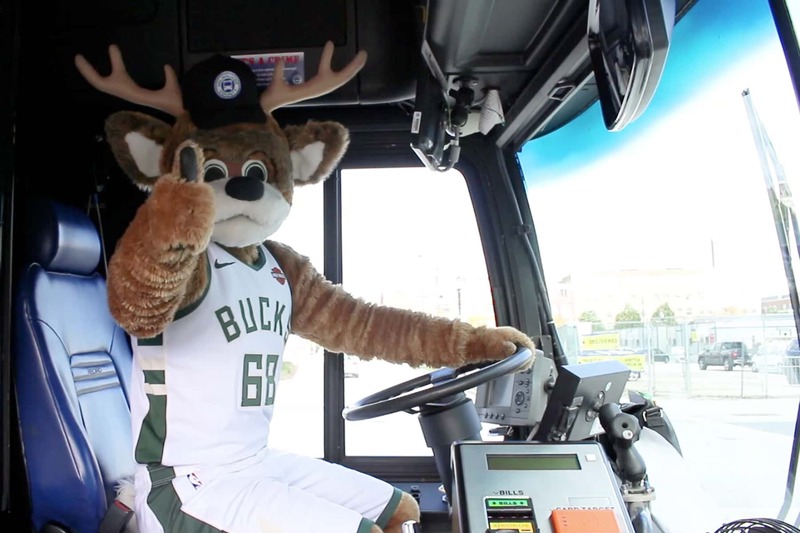 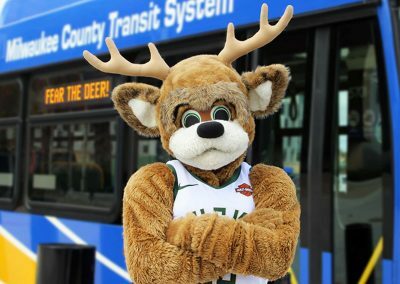 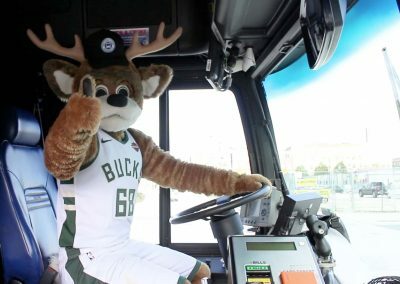 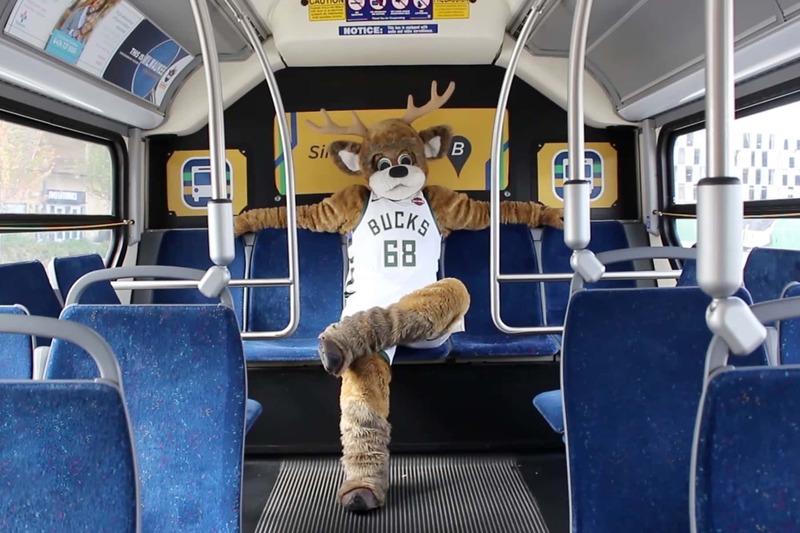 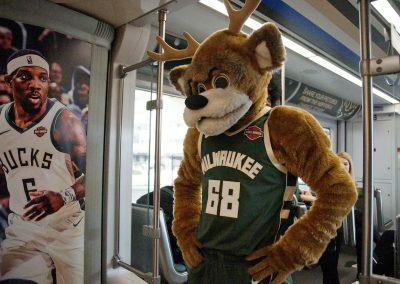 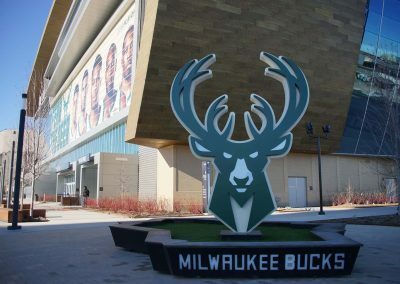 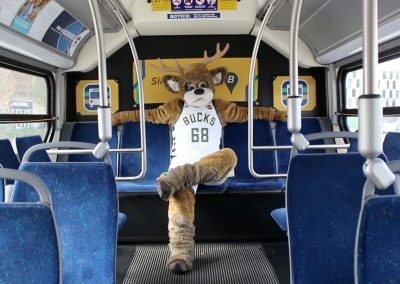 Fans heading downtown to see the Bucks in action, or planning to stop by watch parties and special festivities, can use MCTS for convenient, safe, and affordable transportation. 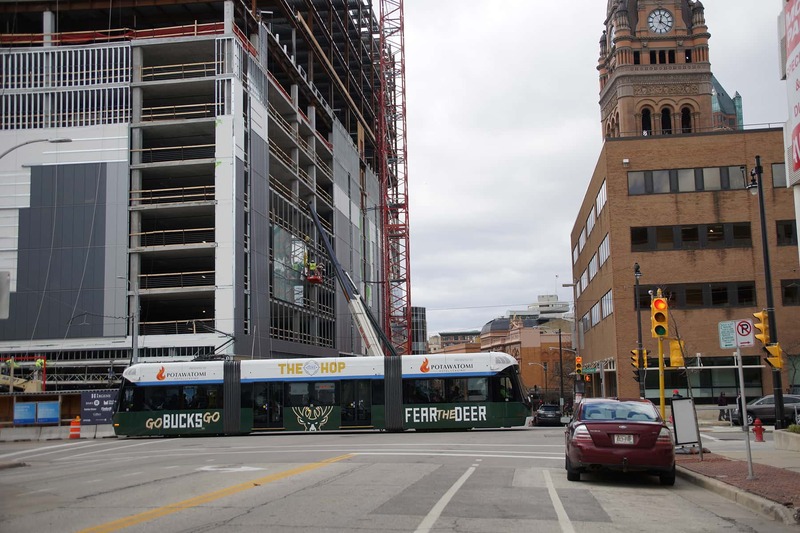 Routes 19, 33, and 80 all make stops near Fiserv Forum and the neighboring plaza. One of the bus stops is at the intersection of 6th Street and Juneau Avenue, just feet from the entertainment complex’s northwest entrance. 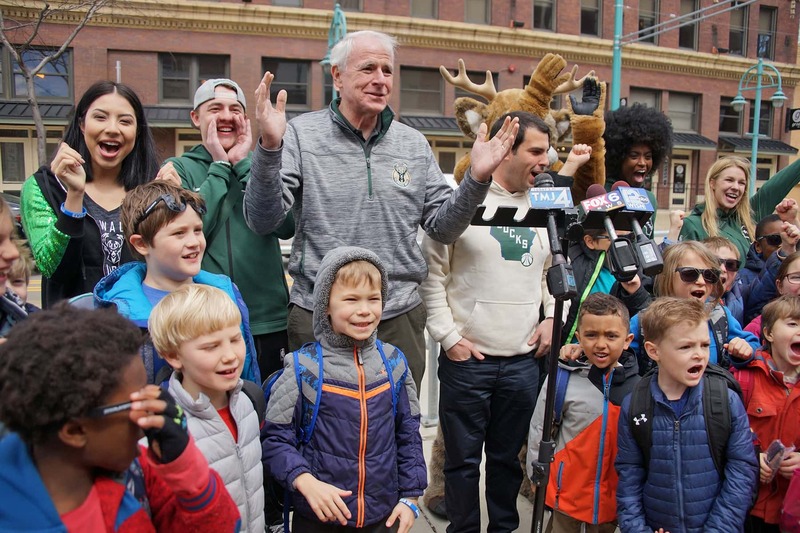 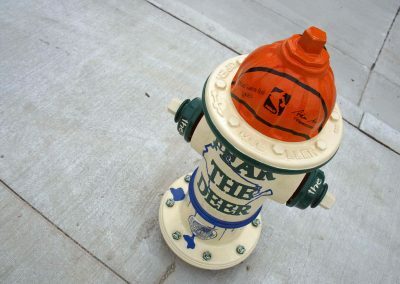 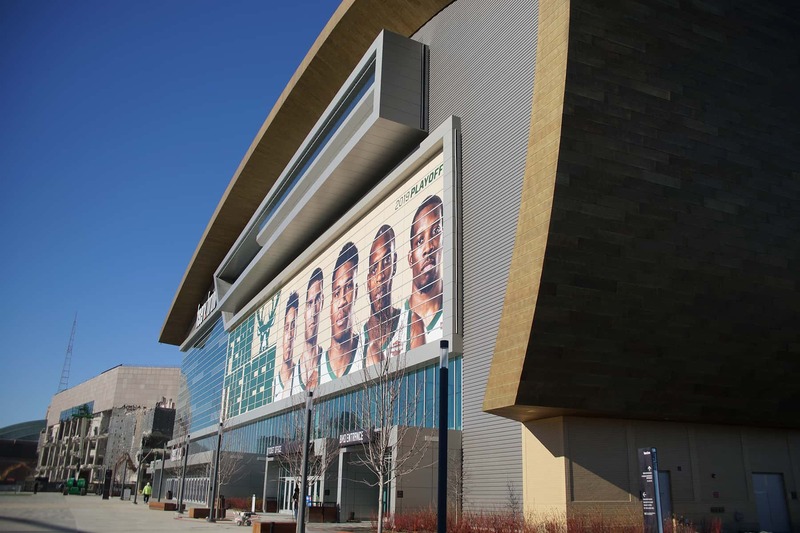 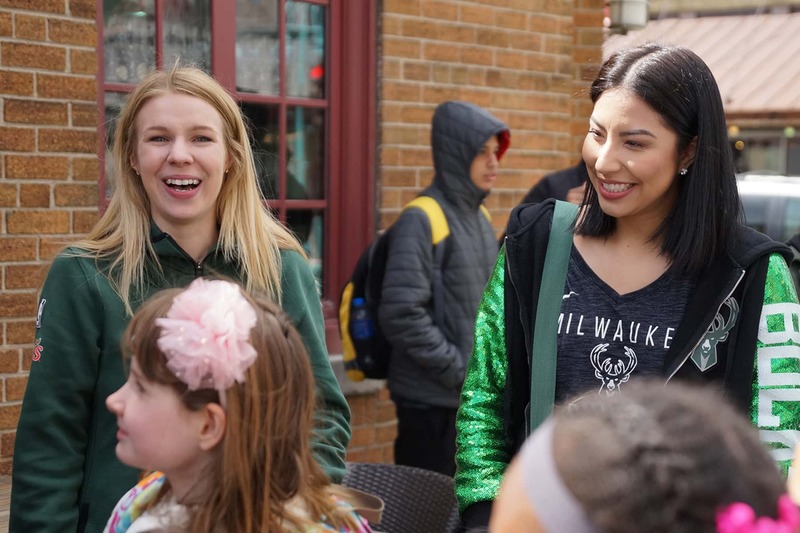 The team has extensive activities planned for the First Round of the 2019 NBA Playoffs, including giveaways and watch parties on the plaza in front of the Fiserv Forum. 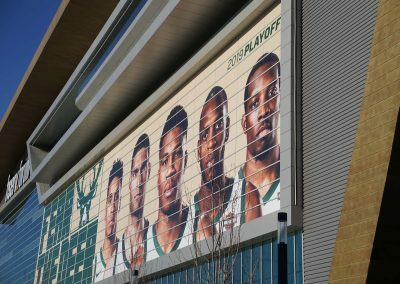 The Milwaukee Bucks go up against the Detroit Pistons on April 14. 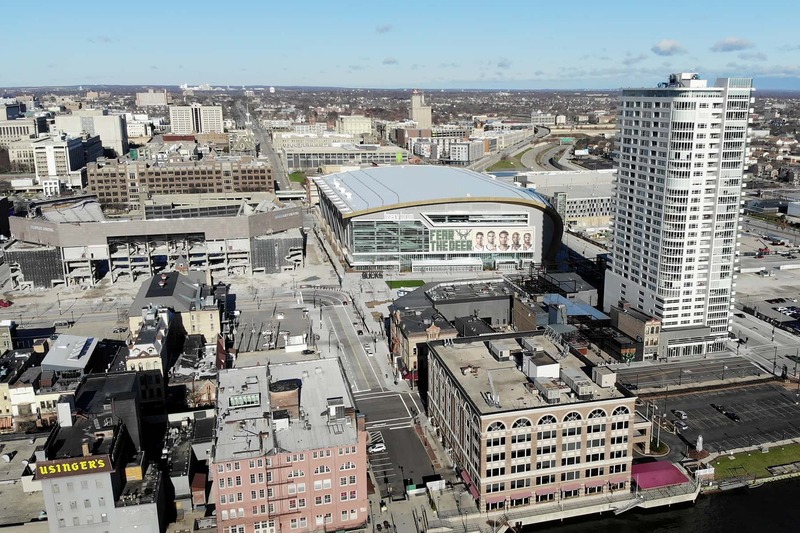 The teams will return to the Fiserv on April 17 for Game 2. 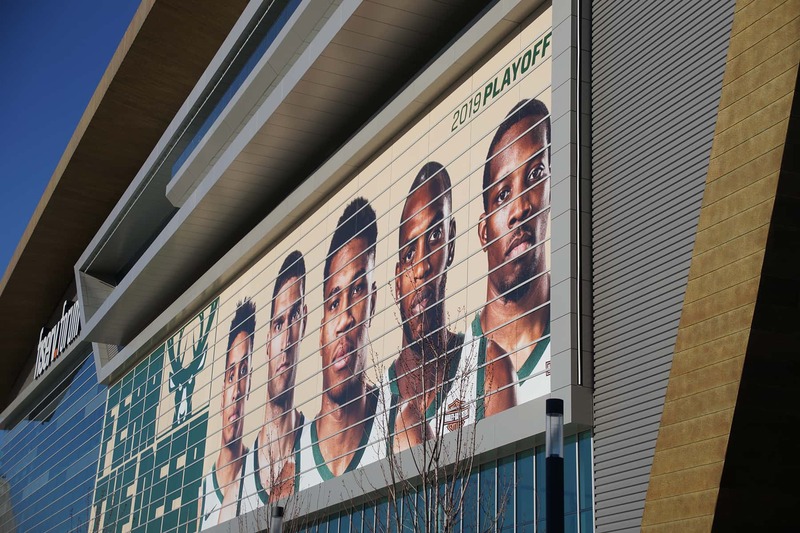 Game 3 and 4 will take place in Detroit on April 20 and 22.